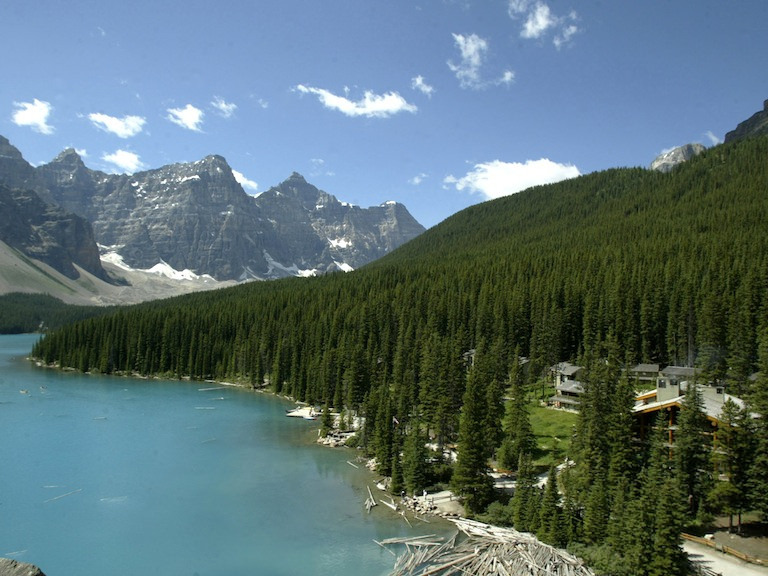 We offer a range of hotels and accommodations across Canada and specialize in the Canadian Rockies and Western Canada. Our buying power and local knowledge ensures you you will get only the most suitable hotel accommodations based on your preferences and budget and at our lowest rates. We also have access to exclusive hotel offers for wholesale which we can pass directly onto you. 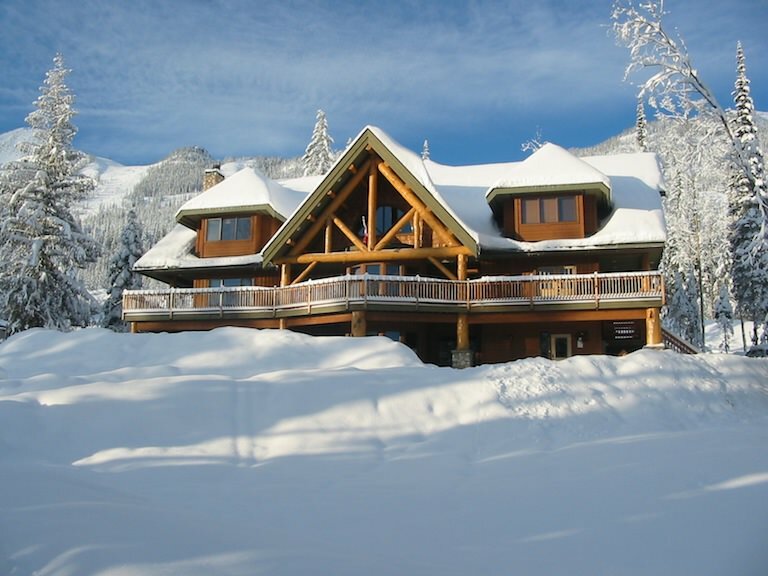 You can view our offered properties below for the Canadian Rockies and Western Canada. Contact us to get started with your vacation planning. Be sure to consider including the Rocky Mountaineer Train in your travel plans through the Canadian Rockies, operating from late April through until early October. Please note that we do our best to keep all the hotel information up-to-date. As changes by the hotels are beyond our control, if any of the information is important to you or if you require clarification, please do not hesitate to let us verify to ensure you are provided with the most current information before making a reservation with us. 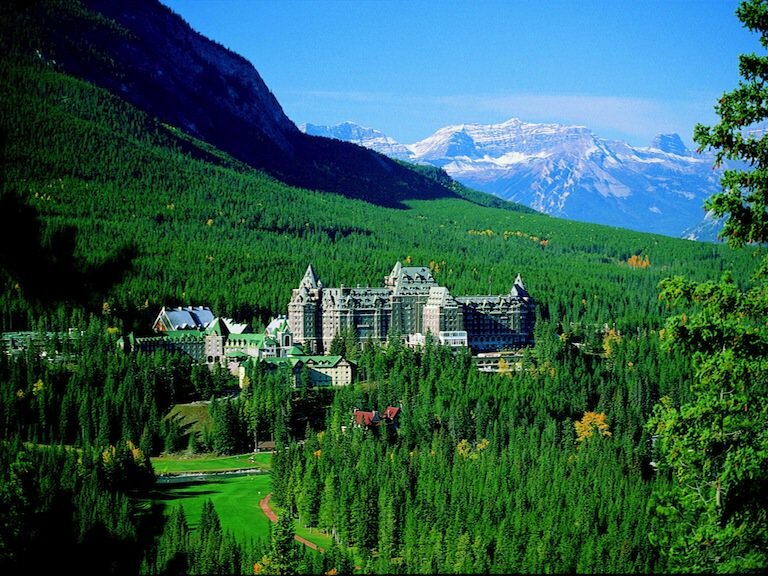 DESCRIPTION: Nestled deep within Banff National Park, this historic and luxurious chateau-style hotel and spa situated on the shore of Lake Louise offers some of the most breathtaking scenery in the world. Accommodation: in-room temperature control, TV, in-room movies (charge), telephone, internet access, coffee maker, mini fridge, iron with board, hair dryer, rollaway bed not available, Green Key. Facilities: non smoking property, 7 restaurants, bar, room service, indoor pool, fitness centre, whirlpool, steam room, spa, beauty salon, parking $30. Wheelchair accessible room(s). Ski facilities: ski storage, ski valet. Summer activities: hiking, horseback riding, canoes. Winter activities: cross country skiing, snowshoeing, skating, sleigh rides. DESCRIPTION: This classic and charming lodge is located on the shore of Moraine Lake, just 15 km from Lake Louise and 65 km from Banff town centre. Accommodation: WIFI internet access (free), coffee maker, fireplace, balcony, hair dryer, rollaway bed not available, Green Key. Facilities: restaurant, non smoking property, dining room, coffee shop, parking free. DESCRIPTION: Located in the heart of Lake Louise village, 10 minutes drive from Lake Louise. Accommodation: TV, telephone, rollaway bed not available. Facilities: restaurant, non smoking property, bar, indoor pool, spa, parking free. DESCRIPTION: Located between Banff & Lake Louise on the scenic Bow Valley Parkway. 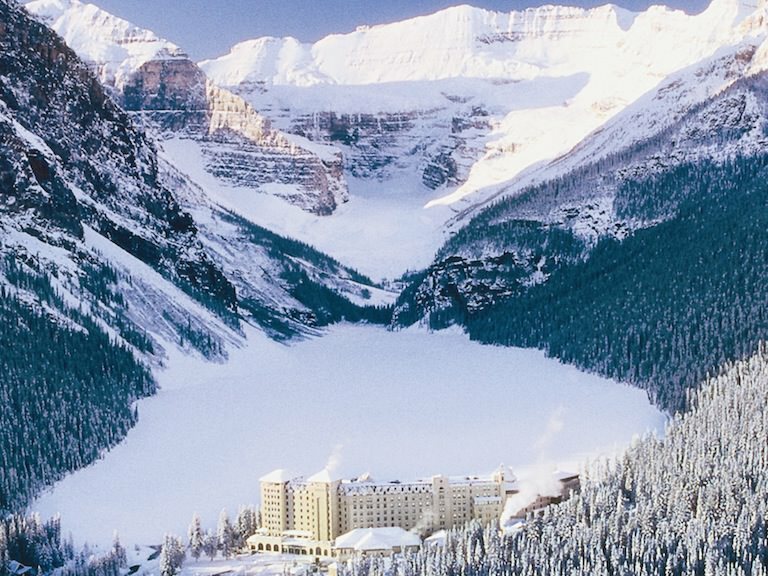 10 minutes drive from the Lake Louise ski resort and 25 minutes from Banff. Accommodation: in-room temperature control, internet access, kitchen. Facilities: 2 floors without elevator, restaurant, non smoking property, bar, fitness centre, sauna, parking free. Accommodation: in-room temperature control, telephone, WIFI internet access (free), in-room safe, rollaway bed free. Facilities: restaurant, non smoking property, bar, hot tub, parking free. DESCRIPTION: Hotel complex situated in Lake Louise amongst the Canadian Rockies in Banff National Park. 5 minute walk to village centre, 4 km to Lake Louise (10 minute drive). Accommodation: TV, telephone, WIFI internet access (free), coffee maker, hair dryer, rollaway bed not available. Facilities: restaurant, bar, indoor pool, sauna, whirlpool, steam room, parking free, pet friendly property. Wheelchair accessible room(s). DESCRIPTION: Situated in Banff National Park on the shores of Bow Lake, this lodge offers fantastic views of the mountains, is a 3-hour drive from Calgary International Airport and 40km north of Lake Louise. Accommodation: in-room temperature control, TV, in-room movies (charge), games (charge), telephone, WIFI internet access in lobby (free), clock radio, coffee maker, mini fridge, iron with board, hair dryer, adjoining rooms available on request, rollaway bed $25. Facilities: restaurant, non smoking property, bar, parking free. DESCRIPTION: This magnificent Scottish baronial castle-style hotel and spa stands in the heart of Banff surrounded by majestic mountain beauty, and is only 1 kilometre from Banff town centre. Accommodation: in-room temperature control, TV, in-room movies (charge), games (charge), telephone, internet access, coffee maker, mini fridge, iron with board, hair dryer, rollaway bed free, Green Key. Facilities: non smoking property, 6 restaurants, bar, room service, indoor pool, outdoor pool, fitness centre, sauna, whirlpool, steam room, spa, beauty salon, boutiques, parking $25. Ski facilities: ski storage, ski rental. Summer activities: tennis courts, golf course, horseback riding. DESCRIPTION: Nestled in a pristine mountain setting above the Banff town site, this hotel offers comfort and luxury combined with breathtaking mountain and alpine valley views. Facilities: non smoking property, 2 restaurants, bar, 24 hr room service, coffee shop, indoor pool, fitness centre, spa, squash courts, activities nearby, dry cleaning, business centre, convention centre, boutiques, children 5 and under eat free, parking $16. Wheelchair accessible room(s). DESCRIPTION: Charming complex situated on the slopes of Tunnel Mountain, just 1 kilometre from downtown Banff. Accommodation: TV, telephone, WIFI internet access (free), clock radio, coffee maker, fireplace, balcony, iron with board, hair dryer, rollaway bed not available. Facilities: restaurant, non smoking property, bar, fitness centre, hot tub, business centre, parking free. DESCRIPTION: Located in central Banff, this charming lodge is just 10 minutes from downtown close to theatres, dining, and museums. Accommodation: air conditioning, in-room temperature control, TV, in-room movies (charge), telephone, WIFI internet access in lobby (free), coffee maker, mini fridge, complimentary newspaper, iron with board, bathrobe, hair dryer, rollaway bed not available. Facilities: restaurant, non smoking property, bar, room service, indoor pool, fitness centre, whirlpool, hot tub, steam room, spa, dry cleaning, parking $12. Wheelchair accessible room(s). DESCRIPTION: Escape to Banff's only ski-in ski-out mountain lodge located 7082 feet, in the high alpine of the Canadian Rockies. The Lodge offers guests a unique stay in the heart of Sunshine Village Ski & Snowboard Resort. Accommodation: TV, telephone, internet access, hair dryer. Facilities: restaurant, non smoking property, bar, fitness centre, sauna, hot tub, games room, parking free. Ski facilities: skiing, ski storage, ski in/ski out. DESCRIPTION: Located in the heart of downtown Banff, this lodge is a 3-minute stroll to the fine shopping, dining, museums, and galleries. Accommodation: TV, telephone, WIFI internet access (free), clock radio, coffee maker, mini fridge, iron with board, in-room safe, hair dryer, rollaway bed not available. Facilities: 3 floors with elevator, non smoking property, sauna, hot tub, steam room, guest laundry, parking free. Wheelchair accessible room(s). 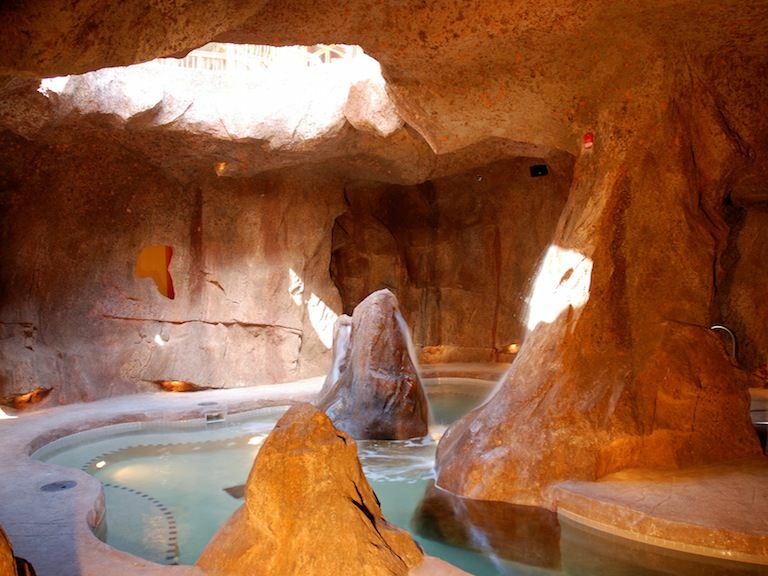 DESCRIPTION: Located on Banff Avenue, this lodge and spa is just a 12-minute walk to downtown shops and restaurants. Accommodation: in-room temperature control, TV, telephone, WIFI internet access in lobby (free), coffee maker, rollaway bed not available. Facilities: 4 floors without elevator, restaurant, non smoking property, bar, room service, fitness centre, steam room, spa, guest laundry, parking free. Wheelchair accessible room(s). DESCRIPTION: Located on Banff Avenue, just minutes from restaurants, shopping, and nightlife. Accommodation: in-room temperature control, TV, telephone, WIFI internet access (free), coffee maker, hair dryer, rollaway bed not available. Facilities: restaurant, non smoking property, bar, sauna, whirlpool, steam room, parking free. DESCRIPTION: Comfortable hotel situated in the heart of downtown Banff, just a short walk to attractions, restaurants, and shops. Accommodation: in-room temperature control, TV, telephone, internet access, clock radio, coffee maker, mini fridge, iron with board, hair dryer, rollaway bed not available. Facilities: restaurant, non smoking property, bar, room service, fitness centre, sauna, whirlpool, steam room, guest laundry, parking free. Ski facilities: ski storage, ski tuning service. DESCRIPTION: Hotel and conference centre located in the centre of Banff overlooking the mountains, and just two blocks from shopping, dining, and entertainment. Accommodation: in-room temperature control, TV, telephone, WIFI internet access (charge), coffee maker, mini fridge, balcony, iron with board, in-room safe, hair dryer, rollaway bed $10, Green Key. Facilities: restaurant, non smoking property, bar, room service, indoor pool, fitness centre, whirlpool, steam room, beauty salon, guest laundry, boutiques, children 5 and under eat free, parking $11. Wheelchair accessible room(s). DESCRIPTION: Located in the heart of the Canadian Rockies on Banff Avenue, this hotel is within walking distance of the town centre, Bow Falls, Cave and Basin National Historic Site, shops and restaurants. Facilities: restaurant, non smoking property, bar, room service, fitness centre, sauna, whirlpool, steam room, parking free. DESCRIPTION: Nestled at the base of Rundle and Cascade Mountains in Banff National Park, this resort complex is just 4 kilometres from the centre of Banff townsite, 1½ hours from Calgary. Accommodation: in-room temperature control, TV, telephone, WIFI internet access (free), mini fridge, fireplace, hair dryer, rollaway bed not available. Facilities: restaurant, bar, room service, coffee shop, indoor pool, fitness centre, sauna, whirlpool, squash courts, guest laundry, parking free, pet friendly property. Ski facilities: ski storage, ski lockers. DESCRIPTION: Intimate mountain lodge in Banff's downtown core, 1 block from Banff Avenue, close to shopping and restaurants. Accommodation: TV, telephone, WIFI internet access in lobby (free), iron with board, hair dryer, rollaway bed not available. Facilities: non smoking property, fitness centre, sauna, whirlpool, guest laundry, parking $5. Wheelchair accessible room(s). DESCRIPTION: This property is consists of furnished individual chalets which rest at the foot of Castle Mountain, midway between Banff and Lake Louise, in the heart of Banff National Park. It is only 25 km from Sunshine Village Ski Resort. Facilities: fitness centre, hot tub, guest laundry, gift shop, liquor store, grocery store, parking free, pet friendly property. Wheelchair accessible room(s). Winter activities: cross country skiing, snowshoeing. DESCRIPTION: Uniquely designed property in Banff National Park, a 10-minute walk to dining and nightlife. Accommodation: air conditioning, in-room temperature control, TV, telephone, internet access, WIFI internet access (free), coffee maker, mini fridge, iron with board, bathrobe, hair dryer, rollaway bed not available, Green Key. Facilities: non smoking property, indoor pool, whirlpool, steam room, dry cleaning, children 5 and under eat free, parking free. DESCRIPTION: A family-oriented resort complex with two indoor waterslides and unique multi-level indoor play zone, located on Tunnel Mountain only a 2 minute drive from central Banff, and just 1½ hour drive to Calgary. Accommodation: air conditioning, in-room temperature control, TV, telephone, WIFI internet access (free), DVD player, coffee maker, kitchen, fireplace, rollaway bed not available. Facilities: non smoking property, indoor pool, waterpark, waterslide, fitness centre, sauna, hot tub, steam room, parking free. DESCRIPTION: The creative layout of the Fox Hotel & Suites offers a quiet retreat after a day of adventure and is only a 10-minute walk from Banff town centre. Accommodation: TV, telephone, WIFI internet access in lobby (free), coffee maker, daily housekeeping service, rollaway bed not available. Facilities: 4 restaurants, restaurant, bar, fitness centre, sauna, hot tub, guest laundry, parking free. Wheelchair accessible room(s). DESCRIPTION: Tucked away on Tunnel Mountain, this resort complex features self-catering condominiums, offering a spectacular view of the Canadian Rockies and is only a 2 minute drive from central Banff. Accommodation: TV, telephone, WIFI internet access (free), clock radio, coffee maker, kitchen, fireplace, hair dryer, rollaway bed not available. Facilities: 2 floors without elevator, non smoking property, hot tub, parking free. DESCRIPTION: Situated on Banff Avenue, this traditional hotel is just 2 blocks from downtown shops and dining. Accommodation: in-room temperature control, TV, telephone, WIFI internet access (free), coffee maker, mini fridge, rollaway bed $5. Facilities: restaurant, non smoking property, indoor pool, sauna, hot tub, parking free. Wheelchair accessible room(s). Ski facilities: ski storage, ski repair services. DESCRIPTION: This comfortable property is situated on Banff Avenue, 15 minute walk from downtown and offers easy access to sightseeing. Accommodation: TV, telephone, WIFI internet access (free), clock radio, coffee maker, mini fridge, balcony, hair dryer, rollaway bed free. Facilities: restaurant, bar, room service, indoor pool, sauna, whirlpool, parking free. Wheelchair accessible rooms with roll in shower. Ski facilities: ski storage, ski rental, ski repair services. DESCRIPTION: Situated on Banff Avenue, this comfortable property is close to downtown Banff's attractions and dining. Accommodation: TV, telephone, WIFI internet access in lobby (free), coffee maker. Facilities: 3 restaurants, restaurant, non smoking property, fitness centre, sauna, hot tub, guest laundry, parking free. 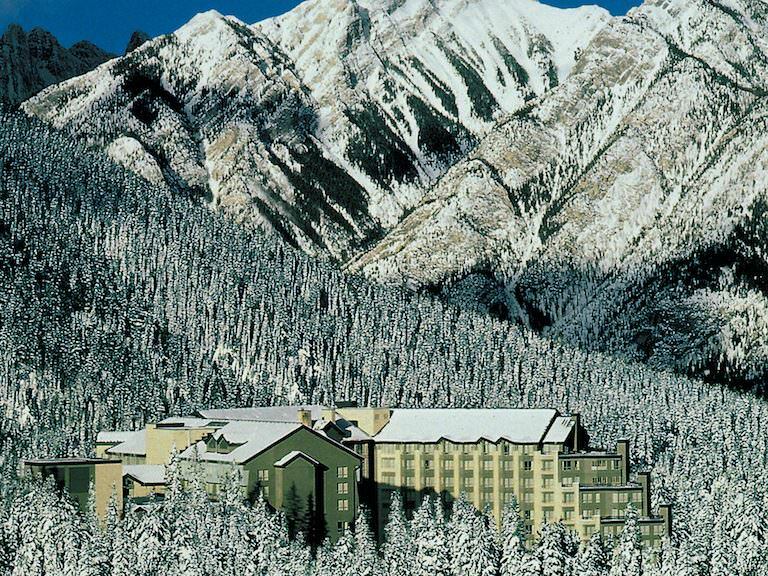 DESCRIPTION: Boutique trendy mountainside hotel located 2 kms from downtown Banff in a woodland setting. Accommodation: in-room temperature control, TV, telephone, WIFI internet access in lobby (free), coffee maker, mini fridge, in-room safe, hair dryer, rollaway bed not available. Facilities: 2 floors without elevator, restaurant, non smoking property, bar, hot tub, parking free, pet friendly property. Wheelchair accessible room(s). DESCRIPTION: Set among the mountains in a protected landscape of Banff National Park, this historic hotel is close to local attractions. Accommodation: in-room temperature control, TV, telephone, internet access, coffee maker, iron with board, in-room safe, hair dryer, rollaway bed not available. Facilities: restaurant, non smoking property, bar, room service, sauna, hot tub, guest laundry, parking free, pet friendly property. DESCRIPTION: Conveniently located on Banff Avenue only minutes from downtown Banff. Accommodation: in-room temperature control, TV, telephone, WIFI internet access (free), WIFI internet access in lobby (free), iron with board, hair dryer, rollaway bed not available. Facilities: 3 floors with elevator, restaurant, non smoking property, bar, indoor pool, fitness centre, whirlpool, airport shuttle (charge), parking free. Wheelchair accessible room(s). DESCRIPTION: Situated in the heart of Alberta's Banff National Park, and surrounded by breathtaking mountain views, this charming resort features exceptional service in an ideal location. Accommodation: TV, telephone, stove, microwave, dishwasher, mini fridge, kitchen, fireplace, balcony, rollaway bed not available. Facilities: non smoking property, restaurant nearby, indoor pool, fitness centre, sauna, whirlpool, airport shuttle (charge), parking free. 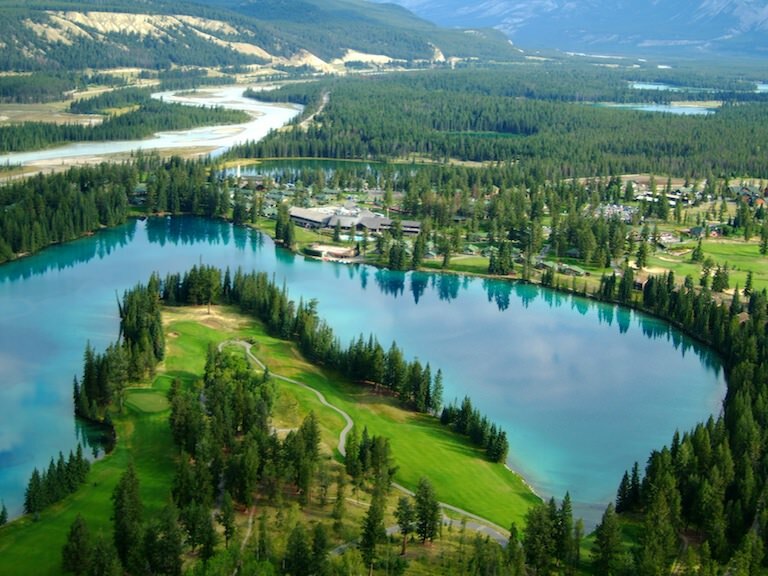 DESCRIPTION: Rustic but elegant lakeside resort lodge situated in the Canadian Rockies, just 7 kilometres from Jasper town centre, and offering one of Canada's greatest golf courses. Accommodation: TV, in-room movies (charge), games (charge), telephone, internet access, clock radio, coffee maker, mini fridge, iron with board, hair dryer, rollaway bed free, Green Key. Facilities: non smoking property, 6 restaurants, bar, room service, outdoor pool, fitness centre, sauna, whirlpool, spa, nature viewing, shops, children 5 and under eat free, parking free. Wheelchair accessible room(s). Summer activities: tennis courts, golf course, hiking, cycling, horseback riding, wildlife viewing, canoes, rafting. DESCRIPTION: Hotel and conference centre just a 15-minute walk to Jasper's downtown core, and offering award-winning dining. Accommodation: in-room temperature control, TV, in-room movies (charge), games (charge), telephone, WIFI internet access (free), clock radio, coffee maker, mini fridge, iron with board, bathrobe, hair dryer, rollaway bed not available, Green Key. Facilities: restaurant, non smoking property, bar, room service, indoor pool, fitness centre, sauna, whirlpool, spa, guest laundry, business centre, gift shop, parking free, pet friendly property. Wheelchair accessible room(s). DESCRIPTION: Log cabins and chalets located in a quiet forest setting within the townsite. Accommodation: TV, coffee maker, rollaway bed not available. Facilities: non smoking property, sauna, hot tub, guest laundry, parking free, pet friendly property. Wheelchair accessible room(s). DESCRIPTION: Situated in the heart of the Canadian Rockies, this resort hotel is just a 10 minute walk to the town centre, close to museums and historic landmarks. Accommodation: TV, telephone, WIFI internet access (free), coffee maker, iron with board, in-room safe, hair dryer, rollaway bed not available. Facilities: restaurant, bar, indoor pool, sauna, hot tub, steam room, guest laundry, business centre, children 5 and under eat free, parking free, pet friendly property. DESCRIPTION: Located just 10 minute walk from the town centre, and famous for its award-winning dining featuring world class chefs. Accommodation: in-room temperature control, TV, telephone, WIFI internet access (free), coffee maker, mini fridge, in-room safe, hair dryer, rollaway bed $8, Green Key. Facilities: restaurant, non smoking property, bar, indoor pool, fitness centre, whirlpool, parking free, pet friendly property. Wheelchair accessible room(s). DESCRIPTION: Located on a historic site in Jasper National Park, and only a 5 minute drive from Jasper, this secluded property offers rustic accommodation with kitchen facilities in cedar log cabins at the north end of the Icefields Parkway. Accommodation: TV, coffee maker, hair dryer. Facilities: dining room, guest laundry. DESCRIPTION: A lodge in the Canadian Rockies, just 10 minutes to Jasper town centre and close to Miette Hot Springs. Accommodation: TV, telephone, WIFI internet access (free), coffee maker, mini fridge, iron with board, hair dryer, adjoining rooms available on request, rollaway bed $8. Facilities: restaurant, non smoking property, bar, indoor pool, fitness centre, sauna, whirlpool, hot tub, guest laundry, gift shop, children 3 and under eat free, parking free, pet friendly property. DESCRIPTION: Mountain resort set amongst the Rocky Mountains in Jasper National Park. 20 minute walk into Jasper town centre. Accommodation: TV, telephone, clock radio, coffee maker, mini fridge, rollaway bed $8. Facilities: restaurant, non smoking property, bar, indoor pool, sauna, whirlpool, hot tub, guest laundry, parking free, pet friendly property. DESCRIPTION: Quiet and peaceful resort located 5 minutes from Jasper National Park and a 30 minute drive from the town of Jasper. Accommodation: TV, hair dryer, rollaway bed $8. Facilities: restaurant, heated outdoor pool, hot tub, parking free, pet friendly property. DESCRIPTION: Nestled on a terraced hillside, overlooking Pyramid Lake and surrounded by the Canadian Rockies. Accommodation: in-room temperature control, TV, telephone, WIFI internet access (free), clock radio, coffee maker, mini fridge, fireplace, balcony, hair dryer, rollaway bed free, Green Key. Facilities: 2 floors without elevator, restaurant, non smoking property, parking free. Wheelchair accessible room(s). Summer activities: hiking, fishing, canoes. DESCRIPTION: Comfortable resort located 53 km south of Jasper, 5 minute walk from Sunwapta Falls. Accommodation: TV, clock radio, coffee maker, mini fridge, patio, rollaway bed $10. Facilities: 1 floor without elevator, restaurant, nature viewing, gift shop, parking free. Summer activities: hiking, fishing, rafting, activities at resort. DESCRIPTION: Nestled in the Rocky Mountains overlooking the Miette and Athabasca Rivers, this lodge is not far from Jasper town site and Jasper National Park. Facilities: restaurant, nature viewing, activities nearby. DESCRIPTION: Located a 10 minute walk to downtown Jasper, this motel-style hotel is close to historic locations such as the Parks Tourist Bureau building and the old CN Railway station. Accommodation: air conditioning, TV, telephone, WIFI internet access in-room (free), WIFI internet access in lobby (free), clock radio, coffee maker, mini fridge, hair dryer, rollaway bed not available. Facilities: 3 floors with elevator, restaurant, non smoking property, bar, indoor pool, fitness centre, sauna, whirlpool, hot tub, parking free, pet friendly property. Wheelchair accessible room(s). DESCRIPTION: Centrally located within walking distance to all shops, services, and outdoor mountain activities. Accommodation: in-room temperature control, TV, telephone, WIFI internet access (free), clock radio, coffee maker, hair dryer, rollaway bed $15. Facilities: restaurant, non smoking property, bar, sauna, hot tub, gift shop, parking free. DESCRIPTION: Motel-style hotel in the heart of the Canadian Rockies, offers great sightseeing and wildlife viewing. Accommodation: in-room temperature control, TV, telephone, WIFI internet access (free), clock radio, coffee maker, mini fridge, hair dryer, rollaway bed not available. Facilities: 2 floors with elevator, whirlpool, guest laundry, parking free. DESCRIPTION: At the foot of the Canadian Rockies, this property is located close to downtown Canmore, just 15 minutes drive from Banff, walking distance to shops and restaurants and 3 minutes drive away from Silvertip Golf Course. Facilities: 4 floors with elevator, restaurant, non smoking property, bar, indoor pool, waterslide, fitness centre, parking free. Wheelchair accessible room(s). DESCRIPTION: Luxury all-suite property located in the Canadian Rockies in Canmore, close to Banff National Park and many world class ski and golf resorts. Accommodation: WIFI internet access (free). Facilities: heated outdoor pool, fitness centre, hot tub, parking free. DESCRIPTION: Comfortable property located in Canmore and nestled amidst the mountains. Accommodation: air conditioning, in-room temperature control, TV, telephone, clock radio, coffee maker, fireplace, iron with board, hair dryer, rollaway bed $15. Facilities: non smoking property, indoor pool, fitness centre, sauna, whirlpool, steam room, parking free, pet friendly property. Wheelchair accessible room(s). DESCRIPTION: Comfortable lodge located in the heart of the Canadian Rockies, minutes from downtown Canmore. Accommodation: air conditioning, internet access, coffee maker, fireplace, balcony, patio, hair dryer, rollaway bed $15. Facilities: sauna, parking free, pet friendly property. DESCRIPTION: One of Canmore's newest hotels, centrally located to four world class ski resorts, as well as six world class golf courses and many other activities for the whole family. Accommodation: TV, telephone, DVD player, clock radio, coffee maker, stove, microwave, kitchen, iron with board, hair dryer, rollaway bed not available. Facilities: restaurant, non smoking property, bar, fitness centre, whirlpool, parking free. DESCRIPTION: Spacious and elegantly decorated hotel close to attractions, including the world class Silvertip Golf Course. Accommodation: air conditioning, TV, in-room movies (charge), telephone, clock radio, coffee maker, hair dryer, rollaway bed free. Facilities: 3 restaurants, restaurant, bar, fitness centre, hot tub, parking free. Wheelchair accessible room(s). DESCRIPTION: Family friendly suite hotel close to downtown Canmore, situated amongst the Rocky Mountains. Accommodation: air conditioning, TV, telephone, WIFI internet access (free), clock radio, coffee maker, microwave, mini fridge, fireplace, hair dryer, adjoining rooms available on request, rollaway bed not available. Facilities: restaurant, bar, indoor pool, fitness centre, sauna, hot tub, spa, guest laundry, parking free. Wheelchair accessible room(s). DESCRIPTION: Hotel and conference centre located just minutes from downtown near shops and restaurants, just over 1 hour drive to Calgary, and 15 minutes to Banff National Park. Accommodation: air conditioning, TV, in-room movies (charge), telephone, WIFI internet access in lobby (free), clock radio, coffee maker, iron with board, hair dryer, rollaway bed $15, Green Key. Facilities: 3 floors with elevator, restaurant, bar, indoor pool, fitness centre, whirlpool, children 5 and under eat free, parking free, pet friendly property. Wheelchair accessible room(s). DESCRIPTION: Located close to downtown Canmore, this hotel offers a great view of the Canadian Rockies. Accommodation: air conditioning, TV, in-room movies (charge), internet access, clock radio, coffee maker, in-room safe, hair dryer, rollaway bed $15. Facilities: restaurant nearby, indoor pool, waterslide, fitness centre, hot tub, parking free, pet friendly property. Wheelchair accessible room(s). DESCRIPTION: Traditional and classic hotel located in downtown Calgary, connected by skywalk to the Telus Convention Centre, the Calgary Tower, and the Glenbow Museum. Accommodation: air conditioning, TV, in-room movies (charge), telephone, internet access, coffee maker, mini bar, iron with board, hair dryer, adjoining rooms available on request, rollaway bed free, Green Key. Facilities: restaurant, bar, room service, indoor pool, fitness centre, whirlpool, business centre, children 5 and under eat free, parking $37. Wheelchair accessible room(s). DESCRIPTION: Luxury boutique hotel situated in downtown Calgary, steps away from the EPCOR Centre for the Performing Arts, the Glenbow Museum, the Calgary Tower, the TELUS Convention Centre and the Stephen's Avenue pedestrian walk, where you can find nine major shopping centers and department stores, retro cinemas, some of Calgary's finest restaurants, pubs, cafes and bars, as well as mix of boutiques and galleries. Accommodation: TV, internet access, WIFI internet access (free), clock radio, coffee maker, mini bar, complimentary newspaper, iron with board, in-room safe, hair dryer, rollaway bed free, Green Key. Facilities: restaurant, non smoking property, bar, fitness centre, sauna, whirlpool, spa. Wheelchair accessible room(s). Wheelchair accessible rooms with roll in shower. DESCRIPTION: A 5 minute drive from Downtown Calgary, this luxury boutique inn is located along the banks of the Bow River, in Kensington, a lively, neighbourhood featuring a variety of restaurants, coffee shops, bakeries and speciality retailers. Accommodation: air conditioning, TV, telephone, internet access. DESCRIPTION: Luxurious hotel located in vibrant downtown Calgary West Side, just 20 minutes from Calgary International Airport next to the Eau Claire Market, and within walking distance to Bow River. Accommodation: air conditioning, TV, telephone, clock radio, mini fridge, hair dryer, rollaway bed free, Green Key. Facilities: restaurant, non smoking property, bar, indoor pool, fitness centre, sauna, children 6 and under eat free, parking $28, pet friendly property. Wheelchair accessible rooms with roll in shower. DESCRIPTION: This modern European style property is located 2 km from the airport and a 15 minute drive from downtown Calgary. Accommodation: TV, telephone, internet access, DVD player, 1 full bathrooms, adjoining rooms available on request. Facilities: 4 floors with elevator, restaurant, non smoking property, bar, parking free. DESCRIPTION: Located just minutes away from Calgary International Airport, this property is a short driving distance from Calgary's most popular attractions. Accommodation: air conditioning, TV, WIFI internet access in lobby (free), coffee maker, complimentary newspaper, iron with board, in-room safe, hair dryer. Facilities: non smoking property, bar, indoor pool, waterslide, fitness centre, hot tub, guest laundry, business centre, parking free. Wheelchair accessible room(s). DESCRIPTION: Modern hotel in Calgary's downtown core on Historic Stephan Avenue Walkway, across the street from the Calgary Tower and attached to the Glenbow Museum and the Epcor Centre for the Arts. Accommodation: air conditioning, TV, in-room movies (charge), telephone, clock radio, rollaway bed free, Green Key. Facilities: restaurant, non smoking property, bar, indoor pool, fitness centre, hot tub, children 5 and under eat free, parking $38, pet friendly property. Wheelchair accessible room(s). DESCRIPTION: Located 9 minutes from Calgary International Airport between the airport and downtown, this hotel offers easy access to the business and entertainment districts. Accommodation: air conditioning, TV, in-room movies (charge), telephone, WIFI internet access (free), mini fridge, iron with board, hair dryer, adjoining rooms available on request, rollaway bed $10, Green Key. Facilities: 10 floors with elevator, restaurant, bar, indoor pool, fitness centre, whirlpool, airport shuttle, parking free, pet friendly property. Wheelchair accessible room(s). DESCRIPTION: Conveniently situated halfway between Calgary International Airport and downtown Calgary, within walking distance of shopping and entertainment. Accommodation: air conditioning, TV, telephone, clock radio, coffee maker, hair dryer, rollaway bed not available. Facilities: restaurant, bar, indoor pool, fitness centre, sauna, whirlpool, business centre, airport shuttle, parking free. Wheelchair accessible room(s). DESCRIPTION: Centrally located in Calgary, this modern hotel is near the Bow River running path and within walking distance of the Calgary Convention Centre. Accommodation: air conditioning, TV, in-room movies (charge), telephone, WIFI internet access (free), mini bar, adjoining rooms available on request, rollaway bed free, Green Key. Facilities: non smoking property, 2 restaurants, bar, indoor pool, fitness centre, sauna, whirlpool, parking $20. Wheelchair accessible room(s). DESCRIPTION: Convenient hotel connected to Calgary International Airport, close to golf courses and the Aero Space Museum. Accommodation: air conditioning, TV, in-room movies (charge), telephone, WIFI internet access in lobby (free), coffee maker, mini fridge, iron with board, hair dryer, rollaway bed $25, Green Key. Facilities: 8 floors with elevator, non smoking property, 2 restaurants, bar, indoor pool, fitness centre, whirlpool, business centre, shops, parking $12. Wheelchair accessible room(s). DESCRIPTION: Hotel and conference centre situated in southeast Calgary, great proximity to shopping and entertainment, short drive to tourist sights such as Stampede Park. Accommodation: TV, in-room movies (charge), games (charge), coffee maker, iron with board, rollaway bed $10. Facilities: restaurant, non smoking property, bar, indoor pool, waterslide, fitness centre, hot tub, gift shop, parking free. DESCRIPTION: This well appointed hotel is conveniently located 30 minutes from both Calgary Airport (YYC) and downtown Calgary. Accommodation: air conditioning, TV, in-room movies (charge), telephone, WIFI internet access (free), coffee maker, mini fridge, complimentary newspaper, iron with board, hair dryer, rollaway bed not available, Green Key. Facilities: 6 floors with elevator, restaurant, fitness centre, gift shop, airport shuttle, parking free, pet friendly property. Wheelchair accessible room(s). DESCRIPTION: Modern hotel located 5 km from the airport and a 15 minute drive to downtown Calgary. Accommodation: TV, telephone, internet access, coffee maker, microwave, mini fridge, iron with board, hair dryer, rollaway bed $20. Facilities: restaurant, bar, indoor pool, fitness centre, business centre, airport shuttle, parking free. Wheelchair accessible room(s). DESCRIPTION: Close to Calgary's International Airport and a short drive to downtown Calgary. Accommodation: air conditioning, TV, in-room movies (charge), telephone, internet access, coffee maker, hair dryer, adjoining rooms available on request, rollaway bed $15. Facilities: restaurant, bar, indoor pool, fitness centre, whirlpool, parking free. Wheelchair accessible room(s). DESCRIPTION: Minutes from Calgary's downtown core, Stampede Park, the BMO Centre, the Scotiabank Saddledome and the Chinook Centre for shopping. Accommodation: TV, in-room movies (charge), telephone, internet access, WIFI internet access (free), coffee maker, complimentary newspaper, iron with board, hair dryer, rollaway bed not available. Facilities: restaurant, bar, indoor pool, fitness centre, activities nearby, children 12 and under eat free, parking free, pet friendly property. Wheelchair accessible room(s). DESCRIPTION: Boutique-style hotel in midtown Calgary, close to the Pengrowth Saddledome, Roundup Centre, Stampede Grounds, downtown shopping, theatres and restaurants. Accommodation: TV, in-room movies (charge), telephone, internet access, coffee maker, iron with board, hair dryer, rollaway bed free. Facilities: 2 restaurants, bar, coffee shop, outdoor pool, fitness centre, parking $18, pet friendly property. DESCRIPTION: A Boutique hotel located near downtown with meeting and event space for business or celebrations. Accommodation: shared bath, WIFI internet access in-room (free), complimentary newspaper. Facilities: heated outdoor pool, fitness centre, sauna, whirlpool, spa, dry cleaning, business centre, gift shop, parking free, pet friendly property. DESCRIPTION: All-suite modern hotel in downtown Calgary, steps from Eau Claire Market, Chinatown, shopping, and the city's best restaurants. Accommodation: air conditioning, TV, in-room movies (charge), telephone, WIFI internet access (charge), coffee maker, microwave, mini fridge, balcony, iron with board, rollaway bed free. Facilities: restaurant, non smoking property, bar, 24 hr room service, indoor pool, fitness centre, whirlpool, parking $38. Wheelchair accessible room(s). DESCRIPTION: Hotel and convention centre in downtown Calgary, close to shopping and Chinatown. Accommodation: air conditioning, TV, telephone, internet access, coffee maker, rollaway bed $10. Facilities: restaurant, bar, outdoor pool, fitness centre, gift shop, children 6 and under eat free, parking $18, pet friendly property. Wheelchair accessible rooms with roll in shower. DESCRIPTION: This modern hotel is just a few minutes from the Calgary Airport (YYC), close to the entertainment and business districts. Accommodation: telephone, WIFI internet access (free), coffee maker, iron with board, hair dryer, rollaway bed not available, Green Key. Facilities: 4 floors with elevator, restaurant, bar, room service, indoor pool, fitness centre, whirlpool, spa, airport shuttle, parking free. Wheelchair accessible room(s). DESCRIPTION: Located in Calgary's downtown core, this hotel is close to restaurants and shopping. Accommodation: air conditioning, TV, telephone, WIFI internet access (free), clock radio, coffee maker, rollaway bed $10, Green Key. Facilities: 19 floors with elevator, restaurant, bar, room service, indoor pool, fitness centre, sauna, hot tub, parking $16, pet friendly property. Wheelchair accessible room(s). DESCRIPTION: This property is located in Deerfoot Meadows in the south east area of Calgary: in the centre of commercial businesses, shopping, entertainment, and numerous restaurants. Accommodation: air conditioning, TV, telephone, WIFI internet access (free), clock radio, coffee maker, microwave, mini fridge, iron with board, hair dryer, rollaway bed not available. Facilities: 4 floors with elevator, restaurant, indoor pool, parking free, pet friendly property. DESCRIPTION: This modern hotel is located across from Canada Olympic Park. Accommodation: TV, telephone, WIFI internet access (free), coffee maker, iron with board, hair dryer, rollaway bed not available, Green Key. Facilities: 4 floors with elevator, restaurant, indoor pool, fitness centre, whirlpool, parking free, pet friendly property. DESCRIPTION: Luxurious lodge situated amongst the Canadian Rockies located at the base of the Elk quad chair at Fernie Alpine Resort. Accommodation: in-room temperature control, TV, telephone, internet access, DVD player, clock radio, kitchen, fireplace, balcony, iron with board, hair dryer, rollaway bed free. Facilities: restaurant, dining room, bar, heated outdoor pool, fitness centre, hot tub, steam room, spa, guest laundry, shops, parking free. Ski facilities: ski storage, ski in/ski out, ski rental. DESCRIPTION: Comfortable hotel, located close to downtown, 10 minutes from Fernie Alpine Ski Resort. Accommodation: in-room temperature control, TV, in-room movies (charge), telephone, internet access, WIFI internet access in-room (free), WIFI internet access in lobby (free), cable internet access in-room (free), clock radio, coffee maker, microwave, mini fridge, iron with board, hair dryer, adjoining rooms available on request, rollaway bed not available. Facilities: 4 floors with elevator, restaurant, bar, indoor pool, hot tub, spa, guest laundry, liquor store, parking free. Wheelchair accessible room(s). DESCRIPTION: This elegant lodge is perched above a picturesque mountain lake. Accommodation: hair dryer, rollaway bed free. Facilities: dining room, hot tub, spa, parking free. DESCRIPTION: Located in the quaint town of Fernie, BC. This riverside lodge is nestled between the Rocky Mountains and boasts unparalleled views in every direction. Accommodation: air conditioning, TV, telephone, WIFI internet access (charge), DVD player, clock radio, coffee maker, iron with board, hair dryer. Facilities: restaurant, non smoking property, indoor pool, waterslide, fitness centre, sauna, hot tub, guest laundry, parking free, pet friendly property. DESCRIPTION: A comfortable ski-in, ski-out hotel style accommodation. Accommodation: in-room temperature control, TV, telephone, clock radio, coffee maker, mini fridge, hair dryer, rollaway bed $10. Facilities: hot tub, guest laundry, parking free, pet friendly property. Ski facilities: ski lockers, ski in/ski out. DESCRIPTION: This lodge offers stylish, modern accommodations and contemporary dining in a spectacular mountain setting with ski-in luxury. Just 100 paces from the gondola. Accommodation: TV, telephone, WIFI internet access (free), CD player, DVD player, coffee maker, mini fridge, hair dryer, housekeeping service (linens changed every 3 days), rollaway bed $50. Ski facilities: ski storage, boot warming service. DESCRIPTION: Being situated next to the Golden Eagle Express gondola, the Glacier Mountaineer Lodge share easily the best location in Kicking Horse. It is also in the centre of the resort meaning you are just steps away from all the nightlife. Accommodation: TV, telephone, internet access, DVD player, mini fridge, hair dryer, rollaway bed not available. Facilities: restaurant, fitness centre, sauna, hot tub, steam room, parking free. Ski facilities: ski storage, ski in/ski out, boot warming service. DESCRIPTION: Palliser Lodge is well situated in one of the area's premier locations, boasting spectacular views of the Rocky Mountains and ski slope activities. The Lodge, just walking distance to the Ski Village at Kicking Horse Mountain. Accommodation: TV, telephone, internet access, fireplace, rollaway bed not available. Facilities: non smoking property, restaurant nearby, fitness centre, hot tub, parking free. Ski facilities: ski storage, ski in/ski out. DESCRIPTION: Vagabond Lodge is located steps away from the Eagle Express Gondola at Kicking Horse Mountain Resort near Golden, B.C. Accommodation: internet access, bathrobe, hair dryer. Facilities: sauna, hot tub, guest laundry, parking free. DESCRIPTION: Luxurious chateau-style hotel situated at the base of Blackcomb Mountain, just a 7-minute walk from Whistler Village. Accommodation: in-room temperature control, TV, in-room movies (charge), games (charge), telephone, WIFI internet access (charge), clock radio, coffee maker, mini fridge, iron with board, in-room safe, bathrobe, hair dryer, rollaway bed free, Green Key. Facilities: 10 floors with elevator, 4 restaurants, bar, coffee shop, indoor pool, heated outdoor pool, fitness centre, sauna, whirlpool, steam room, spa, business centre, boutiques, parking $30. Wheelchair accessible room(s). Ski facilities: ski storage, ski in/ski out, ski valet, ski rental. Summer activities: tennis courts, golf course, hiking. DESCRIPTION: Set at the base of Whistler Mountain in the Creekside Village, First Tracks Lodge is just steps from shopping, dining, and the Creekside Express Gondola, and a 7 minute drive from Whistler. Accommodation: in-room temperature control, TV, internet access, DVD player, coffee maker, full fridge, stove, microwave, dishwasher, kitchen, fireplace, balcony, washer/dryer, daily housekeeping service, rollaway bed $10. Facilities: restaurant, non smoking property, heated outdoor pool, fitness centre, whirlpool, hot tub, steam room, parking $15. Wheelchair accessible room(s). 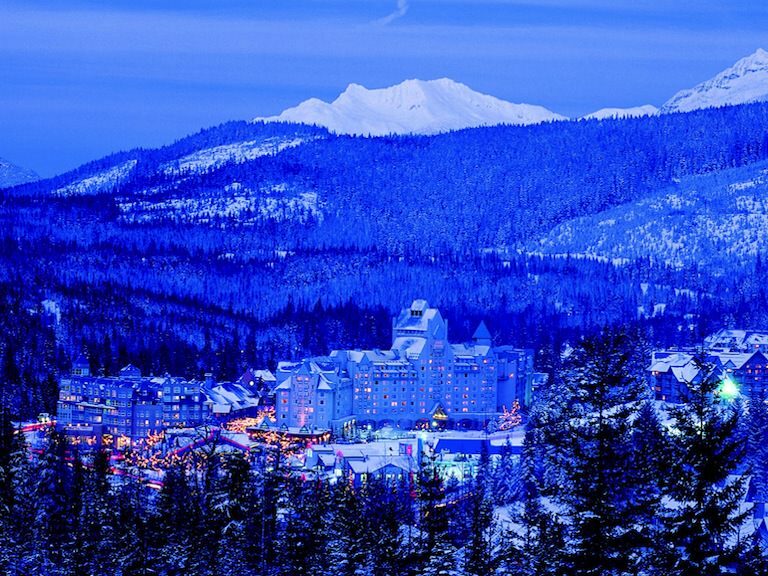 DESCRIPTION: Elegant hotel situated near Blackcomb Mountain, just a 10-minute walk to Whistler Village. Accommodation: TV, telephone, WIFI internet access (free), CD player, DVD player, coffee maker, turn-down service, fireplace, balcony, iron with board, in-room safe, bathrobe, hair dryer, rollaway bed $30. Facilities: 9 floors with elevator, restaurant, bar, 24 hr room service, outdoor pool, fitness centre, sauna, whirlpool, steam room, spa, dry cleaning, guest laundry, babysitting service (charge), children 4 and under eat free, parking $35, pet friendly property. Wheelchair accessible room(s). 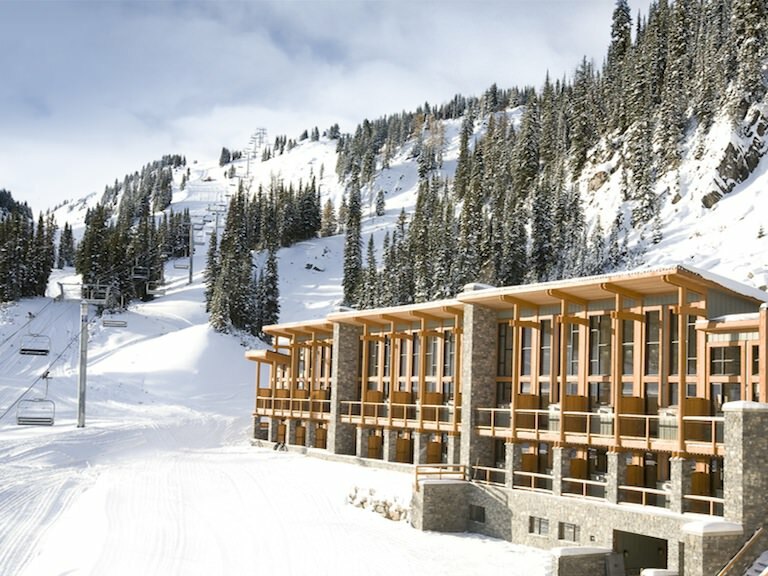 Ski facilities: ski storage, ski concierge. Summer activities: golf course nearby. DESCRIPTION: Situated in the heart of Whistler Village, this hotel offers a variety of services, is pet-friendly, and is close to shopping, dining and nightlife. Accommodation: in-room temperature control, TV, in-room movies (charge), telephone, WIFI internet access (free), coffee maker, mini fridge, hair dryer, rollaway bed not available, Green Key. Facilities: non smoking property, 4 restaurants, bar, room service, fitness centre, sauna, whirlpool, guest laundry, business centre, parking $22, pet friendly property. Wheelchair accessible room(s). DESCRIPTION: Situated in Creekside, this modern, chic slopeside lodge offers one and two bedroom suites. It is just steps away from the Creekside Gondola, offers easy access to the Valley trail, and is only a 7 minute drive from Whistler. Accommodation: TV, internet access, WIFI internet access in-room (free), WIFI internet access in lobby (free), DVD player, coffee maker, full fridge, stove, microwave, dishwasher, kitchen, living room, fireplace, balcony, washer/dryer, rollaway bed $10. Facilities: 5 restaurants, non smoking property, heated outdoor pool, fitness centre, sauna, hot tub, steam room, games room, parking $15, pet friendly property. DESCRIPTION: Elegant hotel and spa in the heart of Whistler, close to shops, restaurants, and the vibrant nightlife of Whistler Village. Accommodation: in-room temperature control, TV, in-room movies (charge), games (charge), telephone, WIFI internet access in-room (free), WIFI internet access in lobby (free), coffee maker, mini bar, iron with board, in-room safe, bathrobe, hair dryer, rollaway bed free, Green Key. Facilities: 8 restaurants, restaurant, non smoking property, bar, room service, heated outdoor pool, fitness centre, sauna, whirlpool, spa, guest laundry, business centre, shops, parking $29, pet friendly property. Wheelchair accessible room(s). Ski facilities: ski storage, ski valet, ski rental. DESCRIPTION: Located in Creekside, these fully appointed 1, 2 & 3 bedroom suites combine ski in/ski out location, style and atmosphere to create a truly unique Whistler experience. The property is close to restaurants, bars and the Creekside Gondola, and is only a 7 minute drive from Whistler Village. Accommodation: in-room temperature control, TV, telephone, internet access, DVD player, coffee maker, full fridge, stove, microwave, dishwasher, kitchen, fireplace, balcony, washer/dryer, daily housekeeping service, rollaway bed $10. Facilities: non smoking property, restaurant nearby, heated outdoor pool, fitness centre, whirlpool, hot tub, games room, parking $15. Wheelchair accessible room(s). Ski facilities: ski lockers, ski-in / ski-out. DESCRIPTION: Tucked on the shores of Nita Lake in historic Creekside Whistler. Approximately a 7 minute drive to Whistler Village. Accommodation: air conditioning, in-room temperature control, TV, telephone, WIFI internet access in-room (free), clock radio, coffee maker, microwave, mini fridge, Green Key. Facilities: restaurant, bar, fitness centre, hot tub, spa, parking $20, pet friendly property. DESCRIPTION: All-suite hotel situated on the base of Whistler Mountain, close to attractions and offering beautiful mountainside scenery. Accommodation: in-room temperature control, TV, in-room movies (charge), games (charge), telephone, WIFI internet access (free), CD player, coffee maker, kitchen, fireplace, balcony, iron with board, in-room safe, hair dryer, rollaway bed $30, Green Key. Facilities: restaurant, non smoking property, bar, room service, heated outdoor pool, fitness centre, whirlpool, hot tub, steam room, spa, guest laundry, parking $28. Wheelchair accessible room(s). Ski facilities: ski storage, ski in/ski out, ski valet, ski shop. DESCRIPTION: Located in the heart of Whistler Village, this boutique-style hotel is close to great restaurants, scenery, and nightlife. Accommodation: in-room temperature control, TV, in-room movies (charge), WIFI internet access (free), coffee maker, kitchen, fireplace, balcony, complimentary newspaper, iron with board, bathrobe, hair dryer, rollaway bed $30, Green Key. Facilities: bar, room service, outdoor pool, fitness centre, sauna, hot tub, spa, guest laundry, business centre, parking $28. Wheelchair accessible room(s). 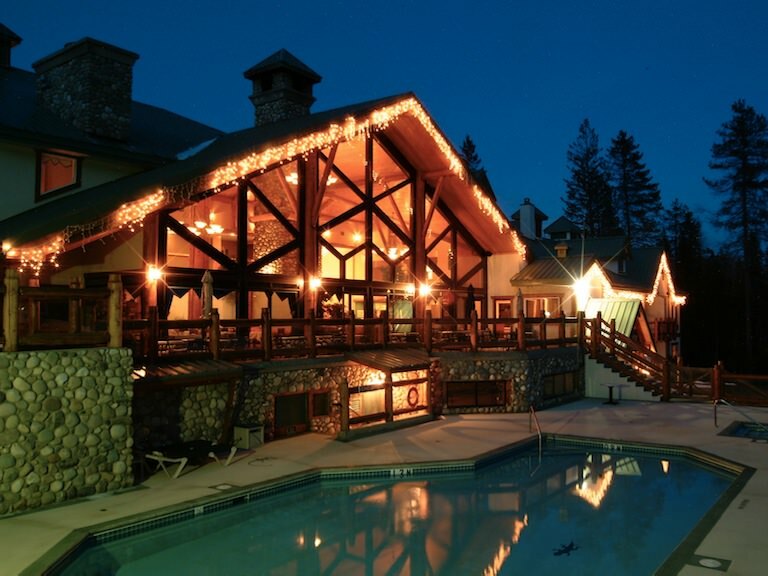 Ski facilities: ski storage, ski valet, ski concierge. DESCRIPTION: Situated in Village North, this all-suite hotel is just a 5-minute stroll to the centre of Whistler Village. Accommodation: in-room temperature control, TV, telephone, WIFI internet access in-room (free), clock radio, coffee maker, kitchenette, fireplace, balcony, complimentary newspaper, iron with board, hair dryer, rollaway bed not available. Facilities: restaurant, non smoking property, bar, room service, heated outdoor pool, sauna, hot tub, spa, guest laundry, parking $20, pet friendly property. Wheelchair accessible room(s). DESCRIPTION: All-suite resort situated at the base of Whistler Mountain, amongst a variety of shops, restaurants, and bars. Accommodation: in-room temperature control, TV, telephone, WIFI internet access (free), coffee maker, kitchen, fireplace, in-room safe, hair dryer, rollaway bed not available, Green Key. Facilities: restaurant, non smoking property, bar, room service, indoor pool, outdoor pool, fitness centre, sauna, hot tub, steam room, spa, guest laundry, business centre, shops, boutiques, parking $30, pet friendly property. Wheelchair accessible room(s). Ski facilities: ski storage, ski valet, ski rental, ski tuning service. DESCRIPTION: Conveniently located adjacent to Whistler Village, just a 5 minute walk to the base of Whistler and Blackcomb mountains. Accommodation: air conditioning, TV, WIFI internet access in-room (free), WIFI internet access in lobby (free), cable internet access in-room (free), coffee maker, mini fridge, iron with board, in-room safe, hair dryer, daily housekeeping service, Green Key. Facilities: 4 floors with elevator, restaurant, non smoking property, bar, outdoor pool, fitness centre, sauna, hot tub, dry cleaning, parking $19, pet friendly property. Wheelchair accessible room(s). DESCRIPTION: Contemporary condominiums conveniently located next to Whistler's Marketplace Centre, close to restaurants & amenities. The Village ski lifts are a 300 metre walking distance. Accommodation: TV, telephone, DVD player, coffee maker, kitchen, fireplace, iron with board, hair dryer, limited housekeeping. Facilities: non smoking property, heated outdoor pool, fitness centre, sauna, hot tub, guest laundry, parking $15. DESCRIPTION: The Aspens is a modern, four-story condominium lodge offering a fantastic ski-in / ski-out location right on Blackcomb Mountain. Accommodation: TV, telephone, internet access, DVD player, kitchen, fireplace, iron with board, hair dryer, limited housekeeping. Facilities: non smoking property, heated outdoor pool, fitness centre, hot tub, parking $15. Wheelchair accessible room(s). Ski facilities: ski storage, ski in/ski out (weather permitting), ski shop. DESCRIPTION: Blackcomb Lodge is steps away from the fun and excitement of Whistler Village. The Village Gondola is short walk through the pedestrian village. Accommodation: in-room temperature control, TV, telephone, DVD player, kitchen, limited housekeeping, rollaway bed $15. Facilities: restaurant, non smoking property, bar, indoor pool, sauna, hot tub, spa, guest laundry, parking $13. Wheelchair accessible room(s). DESCRIPTION: All-suite hotel located near the base of Blackcomb Mountain, amongst Whistler Village's great shops and restaurants. Accommodation: TV, in-room movies (charge), telephone, WIFI internet access in-room (free), WIFI internet access in lobby (free), coffee maker, kitchen, fireplace, balcony, iron with board, hair dryer, housekeeping service (linens changed every 3 days), rollaway bed $10, Green Key. Facilities: 6 restaurants, non smoking property, heated outdoor pool, fitness centre, hot tub, guest laundry, parking $23, pet friendly property. Wheelchair accessible room(s). DESCRIPTION: All-suite hotel in the central Whistler Village, offers easy access to shopping and restaurants. Accommodation: in-room temperature control, TV, in-room movies (charge), telephone, WIFI internet access in-room (free), WIFI internet access in lobby (free), coffee maker, microwave, mini fridge, kitchenette, hair dryer, rollaway bed $15, Green Key. Facilities: non smoking property, bar, heated outdoor pool, fitness centre, sauna, hot tub, spa, guest laundry, parking $24, pet friendly property. Wheelchair accessible room(s). Ski facilities: ski storage (charge), ski rental. DESCRIPTION: The Glacier Lodge is a well-appointed 3-storey condominium lodge offering a convenient ski-in/ski-out location, just steps from Blackcomb Mountain's Wizard quad chair. Accommodation: TV, telephone, internet access, DVD player. Facilities: restaurant, non smoking property, bar, heated outdoor pool, fitness centre, whirlpool, spa, guest laundry, gift shop, parking $15. Ski facilities: ski storage, ski shop, ski rental. DESCRIPTION: All-suite hotel in central Whistler, close to many shops and restaurants in Whistler Village. Accommodation: in-room temperature control, TV, telephone, WIFI internet access in-room (free), WIFI internet access in lobby (free), coffee maker, full fridge, microwave, fireplace, complimentary newspaper, hair dryer, daily housekeeping service, rollaway bed not available. Facilities: 6 restaurants, fitness centre, hot tub, parking $15. Wheelchair accessible room(s). DESCRIPTION: The Horstman House is located in the Benchlands at the foot of Blackcomb Mountain. An enclave of fine homes, lush forest, inviting trails. Close to it all, yet blissfully away from the pace of the village. Accommodation: TV, telephone, VCR, kitchen, fireplace, washer/dryer, limited housekeeping, rollaway bed $15. Facilities: non smoking property, heated outdoor pool, fitness centre, hot tub, games room, parking free. Ski facilities: ski storage, ski-in at Blackcomb Mountain. DESCRIPTION: Hotel situated in Whistler Village, close to all attractions and restaurants and nightlife. Accommodation: in-room temperature control, TV, in-room movies (charge), telephone, WIFI internet access (free), coffee maker, full fridge, iron with board, in-room safe, hair dryer, rollaway bed not available. Facilities: 3 floors with elevator, restaurant, non smoking property, bar, sauna, hot tub, guest laundry, parking $18, pet friendly property. Wheelchair accessible room(s). DESCRIPTION: All-suite condominium-style hotel located in the Blackcomb Benchlands, close to attractions and fine dining. Accommodation: TV, telephone, VCR, kitchen, fireplace, balcony, washer/dryer, limited housekeeping. Facilities: outdoor pool, fitness centre, hot tub, games room, parking $20. Wheelchair accessible room(s). DESCRIPTION: The Marquise Lodge offers great ski-in/ski-out access via the ski-in/ski-out access trail leading to Blackcomb Mountain's Cruiser run (ski conditions permitting). Accommodation: in-room temperature control, TV, telephone, DVD player, coffee maker, kitchen, fireplace, limited housekeeping. Facilities: heated outdoor pool, sauna, hot tub, guest laundry, parking $16. Ski facilities: ski storage, ski in/ski out access trail (snow conditions permitting). DESCRIPTION: All-suite hotel in Village North, close to local shopping and dining. Accommodation: in-room temperature control, TV, telephone, DVD player, coffee maker, kitchen, fireplace, bathrobe, hair dryer, rollaway bed not available. Facilities: restaurant, non smoking property, bar, heated outdoor pool, whirlpool, parking $15. Wheelchair accessible room(s). DESCRIPTION: Stoney Creek is located within steps of the village center and within easy walking distance to the slopes. Comprised of three complexes. Accommodation: TV, telephone, VCR, kitchen, fireplace, washer/dryer, iron with board, limited housekeeping, rollaway bed $15. Facilities: non smoking property, outdoor pool, hot tub, parking free. DESCRIPTION: The Town Plaza Suites are a collection of three, 3-story condominium lodges, offering an ideal location for your active vacation. Walking distance to the Village ski lifts and Whistler Conference Centre. Accommodation: TV, DVD player, kitchen, fireplace, washer/dryer, iron with board, hair dryer, limited housekeeping. Facilities: non smoking property, fitness centre, whirlpool, parking $14. DESCRIPTION: Located in the centre of Whistler Village, this all-suite hotel stands amongst a variety of shops, restaurants, and cafes. Accommodation: TV, telephone, WIFI internet access in-room (free), WIFI internet access in lobby (free), DVD player, coffee maker, kitchenette, limited housekeeping. Facilities: non smoking property, heated outdoor pool, fitness centre, hot tub, guest laundry, parking $15. Wheelchair accessible room(s). DESCRIPTION: Comfortable property located in Whistler village. Accommodation: in-room temperature control, TV, telephone, WIFI internet access in-room (free), VCR, coffee maker, rollaway bed not available. Facilities: outdoor pool, fitness centre, sauna, hot tub, parking $18. Wheelchair accessible room(s). DESCRIPTION: This property is located near Riverside Park and is approximately a 20 minute walk from the City Centre. Facilities: 6 restaurants, restaurant, indoor pool. DESCRIPTION: Just off the Trans-Canada Highway, this hotel is just a 5-minute drive to downtown shopping. Accommodation: TV, telephone, WIFI internet access (free), clock radio, coffee maker, mini fridge, iron with board, hair dryer, Green Key. Facilities: 3 floors with elevator, restaurant, bar, indoor pool, fitness centre, sauna, hot tub, liquor store, parking free, pet friendly property. Wheelchair accessible room(s). DESCRIPTION: Situated in downtown Kamloops, this hotel has a casino on-site, and is close to shopping, dining, and night life. Accommodation: air conditioning, TV, in-room movies (charge), telephone, internet access, clock radio, coffee maker, hair dryer, rollaway bed not available. Facilities: restaurant, bar, fitness centre, casino, parking $10. Wheelchair accessible room(s). DESCRIPTION: Resort lodge just 30 kilometres west of the Trans-Canada Highway, a 45-minute drive to downtown Kamloops. Accommodation: WIFI internet access in-room (free), WIFI internet access in lobby (free), rollaway bed $10. Facilities: 2 floors without elevator, restaurant, bar, nature viewing, children 5 and under eat free, parking free, pet friendly property. Wheelchair accessible room(s). Summer activities: boating, fishing, kayaks, beach. DESCRIPTION: Hotel located right on the shore of the South Thompson River, just a short distance from the city centre. Accommodation: air conditioning, in-room temperature control, TV, telephone, internet access, clock radio, coffee maker, mini fridge, iron with board, hair dryer. Facilities: restaurant nearby, dining room, indoor pool, hot tub, business centre, parking free. Wheelchair accessible room(s). DESCRIPTION: Charming resort located on the South Thompson River, just 15 minutes east of Kamloops. Accommodation: TV, telephone, internet access, WIFI internet access (free), balcony, iron with board, bathrobe, hair dryer, adjoining rooms available on request, rollaway bed free, Green Key. Facilities: 3 floors without elevator, restaurant, bar, outdoor pool, fitness centre, hot tub, business centre, parking free. Wheelchair accessible room(s). Summer activities: golf course nearby, hiking, activities at resort. DESCRIPTION: Boutique hotel in the heart of downtown Kamloops, close to shopping and night life. Accommodation: air conditioning, TV, in-room movies (charge), telephone, WIFI internet access (free), coffee maker, complimentary newspaper, iron with board, hair dryer, rollaway bed $10. Facilities: restaurant, non smoking property, bar, business centre, liquor store, parking $5, pet friendly property. DESCRIPTION: Situated in downtown Kamloops, this hotel and conference centre is close to shopping, restaurants, and nightlife. Accommodation: air conditioning, TV, telephone, clock radio, coffee maker, microwave, mini fridge, hair dryer, rollaway bed not available, Green Key. Facilities: restaurant, non smoking property, indoor pool, fitness centre, hot tub, games room, parking $7. DESCRIPTION: This resort hotel is situated on the shores of Lake Okanagan in Kelowna. Accommodation: air conditioning, TV, telephone, WIFI internet access (free), cable internet access (free), coffee maker, hair dryer, rollaway bed not available, Green Key. Facilities: restaurant, non smoking property, bar, indoor pool, outdoor pool, fitness centre, sauna, hot tub, spa, casino, parking $16. Wheelchair accessible room(s). DESCRIPTION: Located just off Highway #97, a 10-minute drive to downtown Kelowna and close to shopping. Accommodation: shared bath, air conditioning, TV, in-room movies (charge), telephone, internet access, WIFI internet access in-room (free), WIFI internet access in lobby (free), cable internet access in-room (free), clock radio, coffee maker, mini fridge, iron with board, hair dryer, rollaway bed $20, Green Key. Facilities: 8 floors with elevator, restaurant, non smoking property, bar, indoor pool, fitness centre, hot tub, spa, business centre, parking free, pet friendly property. Wheelchair accessible room(s). DESCRIPTION: Located on Harvey Avenue, this hotel is a 5-minute drive to downtown. Accommodation: air conditioning, TV, telephone, coffee maker, hair dryer, rollaway bed not available. Facilities: restaurant, bar, 24 hr room service, coffee shop, heated outdoor pool, fitness centre, hot tub, parking free. DESCRIPTION: Situated just inside the town of Kelowna on Hwy 97, the property is a 5 minute drive from the Airport and walking distance to the Central Park Shopping Centre. Accommodation: air conditioning, TV, telephone, internet access, WIFI internet access in-room (free), cable internet access in-room (free), clock radio, coffee maker, mini fridge, iron with board. Facilities: non smoking property, outdoor pool, waterslide, fitness centre, hot tub, guest laundry, business centre, parking free, pet friendly property. DESCRIPTION: Adjacent to Kelowna International Airport (YLW), the University of British Columbia and two golf courses, this property is within an hour's drive of beautiful parks, water and snow sports. Accommodation: shared bath, air conditioning, in-room temperature control, TV, telephone, WIFI internet access in-room (free), WIFI internet access in lobby (free), clock radio, coffee maker, iron with board, in-room safe. DESCRIPTION: Situated at the entrance to Kelowna on Highway 97, this hotel is 10-minute drive to downtown Kelowna. Accommodation: air conditioning, TV, telephone, WIFI internet access (free), cable internet access (free), clock radio, coffee maker, microwave, mini fridge, iron with board, hair dryer, rollaway bed not available. Facilities: 7 floors with elevator, restaurant nearby, indoor pool, waterslide, fitness centre, hot tub, guest laundry, business centre, parking free. Wheelchair accessible room(s). 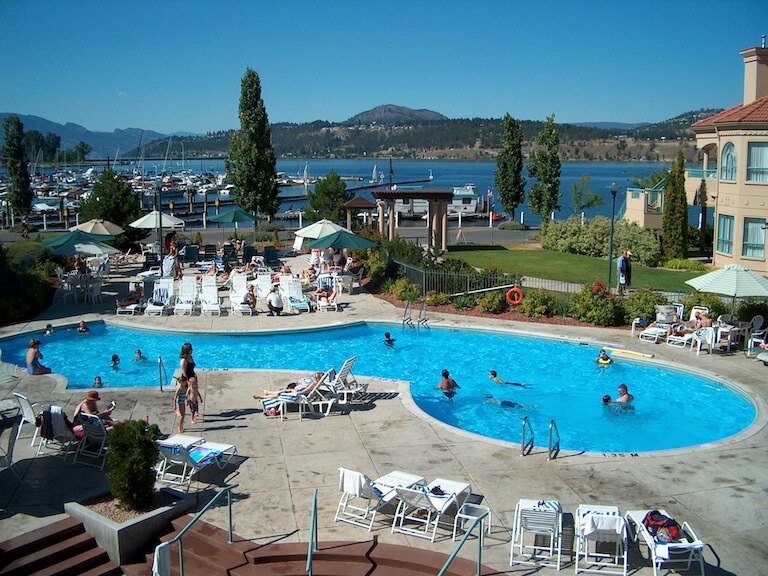 DESCRIPTION: Located steps from Lake Okanagan, this hotel has a private boardwalk and marina. Accommodation: air conditioning, TV, telephone, WIFI internet access (free), iron with board, hair dryer, rollaway bed $15, Green Key. Facilities: 4 floors with elevator, restaurant, bar, indoor pool, fitness centre, hot tub, steam room, liquor store, parking free. DESCRIPTION: This resort is located on the west side of Kelowna on Okanagan Lake, just 19 kilometres from downtown Kelowna. Accommodation: air conditioning, TV, telephone, WIFI internet access (free), clock radio, kitchenette, iron with board, hair dryer, rollaway bed not available. Facilities: restaurant, non smoking property, bar, outdoor pool, fitness centre, whirlpool, hot tub, spa, parking free. Wheelchair accessible room(s). Summer activities: tennis courts, golf course, hiking, cycling, horseback riding, marina, canoes, beach. DESCRIPTION: This waterfront resort is situated on Lake Okanagan in Kelowna, offers a great view of the mountains, lake and features a private theatre and on site restaurant. Accommodation: air conditioning, TV, telephone, internet access, coffee maker, mini fridge, hair dryer, rollaway bed not available, Green Key. Facilities: restaurant, non smoking property, bar, indoor pool, outdoor pool, waterpark, waterslide, fitness centre, sauna, hot tub, steam room, nature viewing, games room, parking free. Wheelchair accessible room(s). Summer activities: tennis courts, activities at resort, beach. DESCRIPTION: Conveniently located close to tourist attractions, shopping and recreational areas. Accommodation: air conditioning, TV, telephone, WIFI internet access (free), coffee maker, mini fridge, iron with board, hair dryer, rollaway bed $15. Facilities: 3 floors with elevator, restaurant, non smoking property, bar, indoor pool, fitness centre, hot tub, parking $10. Wheelchair accessible room(s). DESCRIPTION: Situated on Harvey Avenue just 5 minutes from downtown Kelowna, this hotel is close to local attractions such as wineries and the Kettle Valley Railway. Accommodation: air conditioning, TV, telephone, WIFI internet access (free), coffee maker, mini fridge, iron with board, hair dryer, rollaway bed not available. Facilities: restaurant, bar, indoor pool, fitness centre, hot tub, parking free. Wheelchair accessible room(s). DESCRIPTION: Luxurious hotel in downtown Vancouver, close to shopping, nightlife, and Gastown and featuring an Absolute Spa. Accommodation: air conditioning, TV, in-room movies (charge), telephone, internet access, coffee maker, mini bar, iron with board, bathrobe, hair dryer, rollaway bed free, Green Key. Facilities: restaurant, bar, indoor pool, fitness centre, sauna, whirlpool, spa, parking $39. Wheelchair accessible room(s). DESCRIPTION: Pacific Rim is located in the heart of the financial district, at the edge of Coal Harbour and will feature unobstructed views of the North Shore Mountains and Stanley Park. Accommodation: TV, in-room movies (charge), internet access, clock radio, mini fridge, in-room safe, bathrobe, Green Key. Facilities: restaurant, bar, outdoor pool, fitness centre, spa, business centre, parking $43. DESCRIPTION: Luxurious waterfront hotel on the shores of Burrard Inlet, adjacent to Canada Place and the cruise ship terminal, close to shopping, nightlife, and Gastown. Accommodation: air conditioning, TV, in-room movies (charge), telephone, internet access, coffee maker, mini bar, iron with board, hair dryer, rollaway bed free, Green Key. Facilities: 23 floors with elevator, restaurant, bar, 24 hr room service, outdoor pool, fitness centre, sauna, whirlpool, parking $44. Wheelchair accessible room(s). DESCRIPTION: Situated in downtown Vancouver next to the Pacific Centre shopping mall, this luxurious deluxe hotel is close to restaurants and nightlife. Accommodation: TV, telephone, internet access, clock radio, mini bar, iron with board, bathrobe, hair dryer, rollaway bed free, Green Key. Facilities: restaurant, non smoking property, bar, indoor/outdoor pool, fitness centre, sauna, whirlpool, parking $37, pet friendly property. Wheelchair accessible room(s). 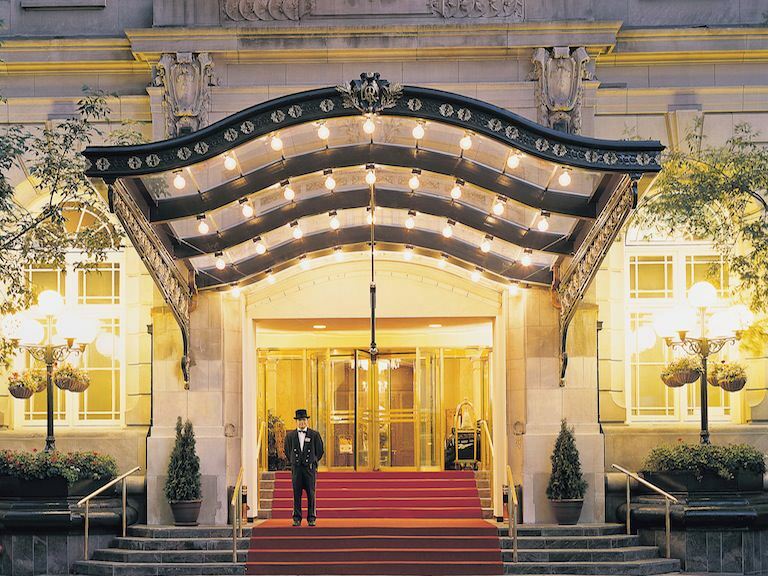 DESCRIPTION: Situated in downtown Vancouver, in the very heart of Canada's hottest shopping destination, L'Hermitage Hotel truly redefines the boutique hotel experience offering an exquisite combination of sophistication, luxury and style. Accommodation: TV, telephone, WIFI internet access (free), cable internet access (free), clock radio, complimentary newspaper, in-room safe. Facilities: non smoking property, outdoor pool, fitness centre, hot tub, dry cleaning, business centre, parking $25. DESCRIPTION: Located at the edge of Coal Harbour, downtown Vancouver's premiere luxury neighbourhood. With its ideal location Loden Vancouver is adjacent to many of Vancouver's most popular attractions-from museums and galleries to world-class shopping and numerous restaurants. Accommodation: TV, WIFI internet access (free), cable internet access (free), rollaway bed $35. Facilities: 14 floors with elevator, restaurant, non smoking property, bar, room service, fitness centre, sauna, spa, dry cleaning, business centre, parking $32, pet friendly property. Wheelchair accessible room(s). DESCRIPTION: Luxurious harbour front hotel in downtown Vancouver, connected to Canada Place, the cruise ship terminal and the Vancouver Convention Centre. Accommodation: air conditioning, TV, in-room movies (charge), telephone, WIFI internet access (charge), cable internet access (charge), coffee maker, mini bar, iron with board, in-room safe, hair dryer, adjoining rooms available on request, rollaway bed free, Green Key. Facilities: 23 floors with elevator, 3 restaurants, bar, 24 hr room service, coffee shop, outdoor pool, fitness centre, sauna, hot tub, spa, business centre, parking $39, pet friendly property. Wheelchair accessible room(s). DESCRIPTION: Situated in the heart of Vancouver close to Vancouver's finest restaurants, boutiques, art galleries, museums and theaters. Accommodation: TV, WIFI internet access (free), DVD player, coffee maker, iron with board, in-room safe, bathrobe, hair dryer, adjoining rooms available on request. Facilities: 12 floors with elevator, restaurant, bar, room service, indoor pool, fitness centre, spa, guest laundry, business centre, parking $42. DESCRIPTION: Located in vibrant downtown Vancouver, the hotel is strategically located for sightseeing, shopping and outdoor adventure, with local skiing and hiking trails just a 15-minute drive away, and only 6 blocks away from cruise ship terminal. Accommodation: TV, WIFI internet access (free), cable internet access (free), DVD player, coffee maker, mini bar, in-room safe, adjoining rooms available on request, Green Key. Facilities: 15 floors with elevator, restaurant, non smoking property, bar, room service, outdoor pool, fitness centre, spa, guest laundry, business centre, babysitting service (charge), airport shuttle (charge), parking $35. Wheelchair accessible room(s). DESCRIPTION: Elegant hotel located in the heart of downtown Vancouver close to shopping and restaurants. Accommodation: air conditioning, TV, in-room movies (charge), telephone, WIFI internet access (charge), CD player, DVD player, clock radio, coffee maker, mini bar, in-room safe, bathrobe, hair dryer, rollaway bed $30, Green Key. Facilities: restaurant, non smoking property, bar, 24 hr room service, indoor pool, fitness centre, sauna, whirlpool, spa, business centre, children 3 and under eat free, parking $30, pet friendly property. Wheelchair accessible room(s). DESCRIPTION: Luxurious boutique property located on Robson Square, in the heart of downtown Vancouver. Accommodation: in-room temperature control, TV, in-room movies (charge), telephone, WIFI internet access (charge), mini bar, complimentary newspaper, in-room safe, bathrobe, hair dryer, rollaway bed $30. Facilities: 14 floors with elevator, restaurant, non smoking property, bar, 24 hr room service, fitness centre, steam room, spa, babysitting service (charge), parking $25. Wheelchair accessible room(s). DESCRIPTION: Set against the waterways of Coal Harbour and the stunning peaks of the North Shore Mountains. The hotel is near Stanley Park, Gastown, the Vancouver Art Gallery, Vancouver Convention Centre, and Robson Street's trendy shopping district. And gourmet food market Urban Fare just around the corner. Accommodation: in-room temperature control, TV, WIFI internet access (free), clock radio, iron with board, hair dryer, Green Key. Facilities: restaurant, non smoking property, room service, outdoor pool, fitness centre, hot tub, guest laundry, business centre, parking $28, pet friendly property. Wheelchair accessible rooms with roll in shower. DESCRIPTION: All-suite luxurious hotel situated in central downtown Vancouver, close to Gastown and world class shopping and dining. Accommodation: air conditioning, TV, telephone, WIFI internet access (free), coffee maker, mini bar, iron with board, hair dryer, rollaway bed free, Green Key. Facilities: restaurant, non smoking property, bar, room service, fitness centre, children 6 and under eat free, parking $33. Wheelchair accessible room(s). DESCRIPTION: Hotel Le Soleil is situated in downtown Vancouver right in the heart of Vancouver's financial, shopping and business districts. Accommodation: air conditioning, TV, telephone, internet access (charge), cable internet access (free), clock radio, coffee maker, mini bar, iron with board, in-room safe, bathrobe, hair dryer, rollaway bed not available, Green Key. Facilities: 16 floors with elevator, restaurant, room service, guest laundry, parking $26. DESCRIPTION: This elegant Vancouver hotel is across from BC Place stadium, and steps from the bustling Robson Street shopping and restaurants. Accommodation: air conditioning, TV, in-room movies (charge), telephone, internet access, WIFI internet access (free), clock radio, coffee maker, mini fridge, iron with board, hair dryer, rollaway bed $30. Facilities: 12 floors with elevator, 2 restaurants, bar, fitness centre, hot tub, steam room, business centre, parking $19, pet friendly property. Wheelchair accessible room(s). DESCRIPTION: Centrally located downtown in the business and entertainment core. Accommodation: air conditioning, TV, in-room movies (charge), telephone, internet access (charge), clock radio, coffee maker, mini fridge, iron with board, in-room safe, bathrobe, hair dryer, rollaway bed $35, Green Key. Facilities: 34 floors with elevator, restaurant, non smoking property, bar, outdoor pool, fitness centre, hot tub, children 4 and under eat free, parking $28, pet friendly property. Wheelchair accessible room(s). DESCRIPTION: Elegant deluxe hotel in downtown Vancouver, across from Pacific Centre shopping mall. Accommodation: air conditioning, TV, telephone, internet access, CD player, coffee maker, mini bar, iron with board, bathrobe, hair dryer, rollaway bed $30, Green Key. Facilities: restaurant, bar, 24 hr room service, indoor pool, fitness centre, steam room, squash courts, parking $40. Wheelchair accessible room(s). DESCRIPTION: Situated downtown, this trendy boutique-style hotel is located in fashionable Yaletown, and close to shopping and nightlife. Accommodation: TV, in-room movies (charge), telephone, WIFI internet access (free), CD player, coffee maker, mini bar, iron with board, in-room safe, hair dryer, adjoining rooms available on request, rollaway bed free. Facilities: 7 floors with elevator, restaurant, bar, 24 hr room service, fitness centre, parking $35, pet friendly property. Wheelchair accessible room(s). DESCRIPTION: Vancouver waterfront hotel overlooking the harbour, within walking distance to the cruise ship terminal and the Vancouver Convention Centre. Accommodation: air conditioning, TV, telephone, cable internet access (free), WIFI internet access in-room (free), WIFI internet access in lobby (free), clock radio, coffee maker, mini fridge, iron with board, in-room safe, hair dryer, rollaway bed free, Green Key. Facilities: 19 floors with elevator, restaurant, non smoking property, bar, room service, indoor pool, fitness centre, whirlpool, parking $26. Wheelchair accessible room(s). DESCRIPTION: Situated in central Vancouver, this hotel is surrounded by the trendy boutiques of Robson Street and Yaletown, close to outdoor markets, clubs, art galleries, and theatres. Accommodation: air conditioning, TV, telephone, WIFI internet access in-room (free), clock radio, coffee maker, iron with board, hair dryer, rollaway bed $30, Green Key. Facilities: 48 floors with elevator, restaurant, bar, indoor pool, sauna, hot tub, spa, parking $33, pet friendly property. Wheelchair accessible rooms with roll in shower. DESCRIPTION: Situated in downtown Vancouver close to the cruise ship terminal, the hotel is close to Gastown and superb dining and entertainment. Accommodation: air conditioning, TV, telephone, WIFI internet access in-room (free), WIFI internet access in lobby (free), cable internet access in-room (free), coffee maker, mini fridge, iron with board, in-room safe, hair dryer, rollaway bed free, Green Key. Facilities: 31 floors with elevator, restaurant, non smoking property, bar, 24 hr room service, indoor pool, fitness centre, sauna, hot tub, steam room, parking $26. Wheelchair accessible room(s). DESCRIPTION: Luxurious hotel in central Vancouver overlooking Stanley Park, within walking distance to world class shopping, attractions and shows, and the finest restaurants. Accommodation: air conditioning, TV, in-room movies (charge), telephone, WIFI internet access in lobby (free), WIFI internet access in-room (charge), cable internet access in-room (charge), clock radio, coffee maker, mini bar, iron with board, hair dryer, adjoining rooms available on request, rollaway bed free, Green Key. Facilities: 9 floors with elevator, restaurant, non smoking property, bar, 24 hr room service, coffee shop, indoor/outdoor pool, fitness centre, business centre, parking $36. Wheelchair accessible rooms with roll in shower. DESCRIPTION: All suite hotel located in the heart of Vancouver's entertainment district. Accommodation: TV, in-room movies (charge), telephone, internet access (charge), coffee maker, microwave, kitchen, iron with board, in-room safe, bathrobe, hair dryer, rollaway bed not available, Green Key. Facilities: restaurant, non smoking property, bar, outdoor pool, fitness centre, sauna, whirlpool, spa, parking $30. Wheelchair accessible room(s). DESCRIPTION: Located in Downtown Vancouver 3 blocks from Robson St. & Yaletown and close to shopping and nightlife. Accommodation: air conditioning, TV, telephone, internet access, clock radio, coffee maker, microwave, mini fridge, iron with board, hair dryer. Facilities: restaurant, bar, parking $16. Wheelchair accessible room(s). DESCRIPTION: Located in downtown Vancouver, this hotel is adjacent to English Bay and Stanley Park, close to shops and restaurants. Accommodation: air conditioning, TV, WIFI internet access (free), coffee maker, iron with board, hair dryer, rollaway bed not available, Green Key. Facilities: 6 floors with elevator, restaurant, non smoking property, bar, fitness centre, sauna, dry cleaning, guest laundry, parking $15, pet friendly property. Wheelchair accessible room(s). DESCRIPTION: Situated in downtown Vancouver, this hotel is close to shopping and within walking distance to Granville Island. Accommodation: air conditioning, TV, telephone, WIFI internet access (free), coffee maker, hair dryer, adjoining rooms available on request, rollaway bed $20. Facilities: 12 floors with elevator, restaurant, non smoking property, bar, room service, fitness centre, sauna, whirlpool, dry cleaning, guest laundry, parking $20. Wheelchair accessible room(s). DESCRIPTION: This hotel is located on Robson Street in downtown Vancouver, close to world class shopping and dining, and offering exceptional views of English Bay and Burrard Inlet. Accommodation: TV, telephone, WIFI internet access (free), cable internet access in-room (free), coffee maker, mini fridge, iron with board, in-room safe, bathrobe, hair dryer, rollaway bed not available. Facilities: 31 floors with elevator, restaurant, non smoking property, bar, indoor pool, fitness centre, sauna, whirlpool, business centre, parking $17. Wheelchair accessible room(s). DESCRIPTION: This residential atmosphere hotel is located in the heart of the city centre, just one block from the lively Robson Street with its sophisticated shopping and fine dining. Accommodation: air conditioning, TV, telephone, WIFI internet access (free), cable internet access (free), DVD player, coffee maker, microwave, kitchen, bathrobe, hair dryer, rollaway bed $20. Facilities: fitness centre, guest laundry, parking $25. DESCRIPTION: Modern hotel and spa in downtown Vancouver, close to shopping, restaurants, and nightlife. Accommodation: TV, telephone, WIFI internet access in-room (free), coffee maker, iron with board, hair dryer, rollaway bed free. Facilities: 30 floors with elevator, restaurant, bar, coffee shop, indoor pool, spa, parking $20. Wheelchair accessible room(s). Wheelchair accessible rooms with roll in shower. DESCRIPTION: Elegant hotel overlooking Stanley Park and English Bay beaches, close to central Vancouver near shopping and entertainment. Accommodation: air conditioning, TV, in-room movies (charge), telephone, WIFI internet access (free), mini bar, iron with board, hair dryer, rollaway bed free. Facilities: restaurant, non smoking property, bar, 24 hr room service, indoor pool, fitness centre, sauna, squash courts, parking $25. Wheelchair accessible room(s). DESCRIPTION: Comfortable boutique hotel in the heart of Vancouver, close to shopping and the entertainment district. Accommodation: air conditioning, TV, in-room movies (charge), telephone, WIFI internet access (free), clock radio, coffee maker, iron with board, hair dryer, rollaway bed not available. Facilities: restaurant, bar, parking $18. DESCRIPTION: This elegant hotel stands tall on Robson Street and offers a great view of the Pacific Ocean and Vancouver's coastal mountains; prime downtown location close to Stanley Park and the Vancouver Art Gallery. Accommodation: air conditioning, TV, telephone, internet access, clock radio, coffee maker, mini fridge, iron with board, hair dryer, rollaway bed $20. Facilities: restaurant, bar, coffee shop, fitness centre, parking $15. Wheelchair accessible room(s). DESCRIPTION: Elegant hotel in the heart of Vancouver's business and entertainment district, close to shopping and attractions. Accommodation: TV, in-room movies (charge), telephone, coffee maker, mini fridge, iron with board, in-room safe, hair dryer, rollaway bed free, Green Key. Facilities: restaurant, bar, fitness centre, hot tub, business centre, parking $20. Wheelchair accessible room(s). DESCRIPTION: Located 20 minutes from Downtown Vancouver and close to Capilano Suspension Bridge and Grouse Mountain. Accommodation: TV, telephone, WIFI internet access (free), coffee maker, microwave, mini fridge, iron with board, in-room safe, hair dryer, adjoining rooms available on request, rollaway bed $10. Facilities: restaurant, bar, indoor pool, fitness centre, sauna, hot tub, spa, parking free. Wheelchair accessible room(s). DESCRIPTION: Centrally located in downtown Vancouver, this hotel is close to shopping, nightlife, and attractions. Accommodation: air conditioning, TV, telephone, WIFI internet access (free), clock radio, coffee maker, hair dryer. Facilities: restaurant, bar, indoor pool, fitness centre, children 12 and under eat free, parking $21. Wheelchair accessible room(s). DESCRIPTION: Situated on West Broadway, this hotel is just a 5-minute drive to downtown Vancouver and is two blocks away from the Canada Line Sky Train. Accommodation: air conditioning, TV, telephone, coffee maker, iron with board, hair dryer, rollaway bed not available. Facilities: restaurant, bar, indoor pool, fitness centre, children 12 and under eat free, parking $17. DESCRIPTION: All-suite apartment hotel centrally located next to Stanley Park, within walking distance to shopping, restaurants and entertainment. Accommodation: TV, telephone, WIFI internet access (charge), coffee maker, kitchen, washer/dryer, hair dryer, rollaway bed not available. Facilities: fitness centre, sauna, parking $20. DESCRIPTION: Located in downtown Vancouver, close to Stanley Park, Granville Island, BC Place, and great shopping. Accommodation: air conditioning, TV, telephone, WIFI internet access (free), coffee maker, hair dryer, rollaway bed $20. Facilities: 7 floors with elevator, restaurant, non smoking property, bar, outdoor pool, parking $18, pet friendly property. Wheelchair accessible rooms with roll in shower. DESCRIPTION: Located in downtown Vancouver, within close proximity to the Convention Centre, Yaletown, a vibrant dining scene and world-class shopping. Accommodation: air conditioning, TV, telephone, internet access, WIFI internet access (free), clock radio, coffee maker, kitchen, iron with board, in-room safe, hair dryer, adjoining rooms available on request, rollaway bed not available, Green Key. Facilities: 22 floors with elevator, restaurant, non smoking property, indoor pool, fitness centre, hot tub, guest laundry, business centre, parking $19. Wheelchair accessible room(s). DESCRIPTION: All-suite hotel in downtown Vancouver, located in the centre of Yaletown, close to shopping and entertainment. Accommodation: TV, in-room movies (charge), telephone, kitchen, iron with board, hair dryer, rollaway bed not available. Facilities: restaurant, indoor pool, fitness centre, sauna, hot tub, parking $21. DESCRIPTION: Situated in the heart of the theatre district, this downtown hotel is close to Robson Street shopping. Accommodation: air conditioning, TV, in-room movies (charge), telephone, coffee maker, hair dryer, Green Key. Facilities: 14 floors with elevator, 2 restaurants, bar, indoor pool, fitness centre, hot tub, parking $21, pet friendly property. Wheelchair accessible room(s). DESCRIPTION: Tucked away close to the beach and nearby Stanley Park, this all-suite hotel is in downtown Vancouver close to the shopping and business districts. Accommodation: air conditioning, TV, telephone, coffee maker, kitchen, washer/dryer, iron with board, hair dryer, rollaway bed not available, Green Key. 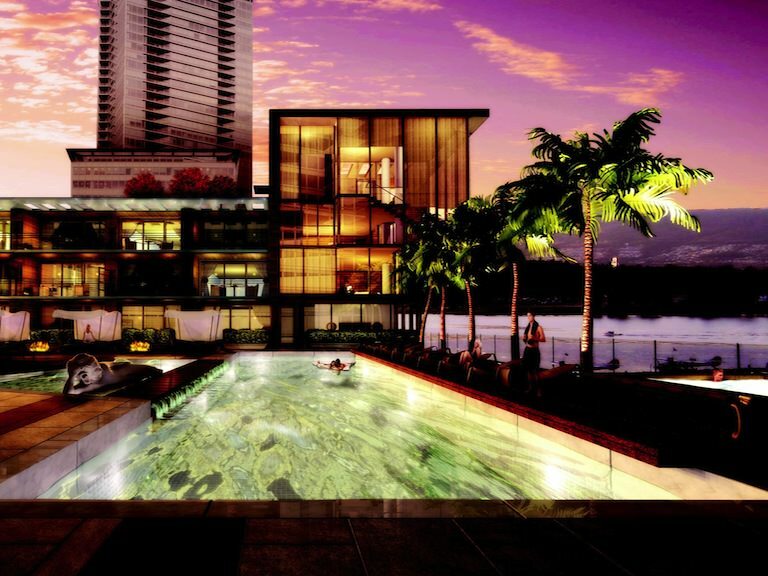 Facilities: 24 floors with elevator, restaurant, outdoor pool, spa, business centre, parking $26, pet friendly property. Wheelchair accessible room(s). DESCRIPTION: Heritage hotel located in the heart of downtown Vancouver, close to shopping and attractions. Accommodation: air conditioning, TV, telephone, WIFI internet access (free), cable internet access (free), coffee maker, iron with board, rollaway bed not available. Facilities: 5 floors with elevator, restaurant, bar, coffee shop, parking $32. Wheelchair accessible room(s). DESCRIPTION: Sunset Inn & Suites is unique among hotels in downtown Vancouver for the spaciousness of the apartment-size suites, tasteful décor and furnishings. Walk to Vancouver's most scenic attractions from our great location on a quiet residential street. Accommodation: air conditioning, TV, telephone, WIFI internet access (free), cable internet access (free), DVD player, clock radio, coffee maker, kitchen, balcony, in-room safe. Facilities: non smoking property, fitness centre, guest laundry, parking free. DESCRIPTION: A retro west coast hotel concept, the Burrad is situated in one of downtown Vancouver's best locations. Enjoy Granville & Davie streets, Yaletown, Granville Island, the seawall - all within minutes from your door. Accommodation: TV, telephone, WIFI internet access (free), clock radio, coffee maker, mini fridge, rollaway bed $30. Facilities: non smoking property, coffee shop, fitness centre, business centre, parking $20. DESCRIPTION: An intimate boutique hotel located on Robson Street. Accommodation: air conditioning, TV, in-room movies (charge), telephone, WIFI internet access (free), cable internet access (free), clock radio, coffee maker, mini fridge, iron with board, hair dryer, rollaway bed $30, Green Key. Facilities: restaurant, non smoking property, fitness centre, parking $29. Wheelchair accessible room(s). DESCRIPTION: Conveniently located on Robson Street in the heart of Vancouver's entertainment district. Accommodation: air conditioning, TV, telephone, WIFI internet access (free), coffee maker, microwave, mini fridge, iron with board, rollaway bed not available. Facilities: 16 floors with elevator, restaurant, fitness centre, sauna, whirlpool, parking $26. Wheelchair accessible room(s). 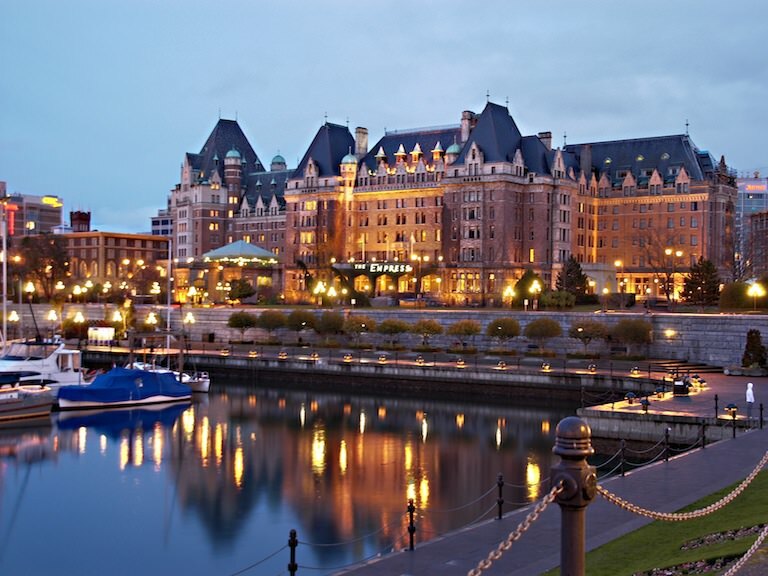 DESCRIPTION: Luxurious chateau-style hotel in downtown Victoria, overlooking the Inner Harbour, and adjacent to the Victoria Conference Centre. Accommodation: TV, in-room movies (charge), telephone, WIFI internet access (charge), mini bar, iron with board, hair dryer, rollaway bed free, Green Key. Facilities: 8 floors with elevator, 2 restaurants, bar, indoor pool, fitness centre, sauna, whirlpool, spa, parking $29. Wheelchair accessible room(s). DESCRIPTION: Luxurious hotel situated in Victoria's inner harbour, across the street from parliament buildings and within walking distance to boutiques, museums, galleries, and cafés. Accommodation: air conditioning, TV, telephone, WIFI internet access (free), cable internet access in-room (free), coffee maker, mini bar, in-room safe, hair dryer, rollaway bed $30, Green Key. Facilities: 10 floors with elevator, restaurant, non smoking property, bar, 24 hr room service, indoor pool, fitness centre, spa, children 4 and under eat free, parking $17, pet friendly property. Wheelchair accessible room(s). DESCRIPTION: Located in a quiet residential location, the Oak Bay Beach Hotel is uniquely situated amidst the mansions and estates of the Oak Bay waterfront, overlooking the San Juan Islands and Mount Baker, and within walking distance to the Victoria Golf Club and Oak Bay Marina. Accommodation: TV, telephone, WIFI internet access (free), rollaway bed not available. Facilities: 6 floors with elevator, restaurant, bar, room service, coffee shop, fitness centre, sauna, spa. Summer activities: hiking, cycling, kayaks. DESCRIPTION: Luxurious oceanfront resort located on Brentwood Bay in the heart of wine country and next to the famous Butchart Gardens. Accommodation: TV, telephone, internet access, DVD player, clock radio, coffee maker, mini fridge, in-room safe, bathrobe, rollaway bed not available. Facilities: restaurant, non smoking property, bar, heated outdoor pool, fitness centre, hot tub, spa, business centre, parking free. Wheelchair accessible room(s). DESCRIPTION: This resort-style hotel and marina on the Inner Harbour is situated in downtown Victoria close to shopping and restaurants. Accommodation: air conditioning, TV, in-room movies (charge), telephone, WIFI internet access (free), coffee maker, mini bar, iron with board, hair dryer, rollaway bed not available, Green Key. Facilities: restaurant, non smoking property, bar, 24 hr room service, indoor pool, outdoor pool, fitness centre, sauna, whirlpool, parking $12, pet friendly property. Wheelchair accessible room(s). DESCRIPTION: Luxurious hotel located on Victoria Inner Harbour, just a 5-minute walk to downtown Victoria, close to shopping and entertainment. Accommodation: air conditioning, TV, telephone, WIFI internet access (free), cable internet access (free), coffee maker, mini bar, hair dryer, rollaway bed free, Green Key. Facilities: restaurant, non smoking property, bar, indoor pool, fitness centre, sauna, whirlpool, spa, squash courts, children 6 and under eat free, parking $16. Wheelchair accessible room(s). DESCRIPTION: Luxury boutique hotel and spa situated in downtown Victoria, a close walk to the waterfront, boutiques, restaurants, and galleries. Accommodation: air conditioning, TV, telephone, internet access, coffee maker, mini bar, iron with board, bathrobe, hair dryer, adjoining rooms available on request, rollaway bed $20, Green Key. Facilities: restaurant, non smoking property, bar, fitness centre, spa, parking $24. DESCRIPTION: Parkside Victoria Resort & Spa is a sustainable all-suite resort, situated one block from the Victoria Conference Centre and two blocks from the Inner Harbour. Accommodation: TV, telephone, internet access, kitchen, Green Key. Facilities: restaurant, bar, indoor pool, fitness centre, hot tub, spa, parking $15. Wheelchair accessible room(s). DESCRIPTION: Downtown Victoria hotel close to the Inner Harbour. Accommodation: air conditioning, TV, telephone, WIFI internet access (free), clock radio, coffee maker, iron with board, in-room safe, bathrobe, hair dryer, rollaway bed free, Green Key. Facilities: restaurant, non smoking property, bar, indoor pool, fitness centre, sauna, hot tub, gift shop, parking $16, pet friendly property. Wheelchair accessible room(s). DESCRIPTION: Elegant property located alongside the Jack Nicklaus Championship golf course and 20 minutes from Victoria. Accommodation: air conditioning, TV, in-room movies (charge), telephone, internet access, clock radio, kitchenette, balcony, iron with board, in-room safe, hair dryer, adjoining rooms available on request, rollaway bed free. Facilities: restaurant, non smoking property, bar, 24 hr room service, outdoor pool, fitness centre, hot tub, spa, parking free, pet friendly property. DESCRIPTION: Located in romantic downtown Victoria, British Columbia, Abigail's Hotel is a boutique bed-and-breakfast hotel that offers a distinctive and charming experience. Accommodation: air conditioning, TV, internet access, DVD player, clock radio, fireplace, room size: approximately 185 square feet. Facilities: non smoking property, parking free. DESCRIPTION: Situated in the centre of the city's Old Town, this downtown Victoria hotel is within walking distance to parks and gardens, specialty shops and boutiques, and the business district. Accommodation: air conditioning, TV, in-room movies (charge), telephone, internet access, coffee maker, iron with board, in-room safe, hair dryer, rollaway bed $20. Facilities: 7 floors with elevator, restaurant, fitness centre, business centre, parking $12, pet friendly property. Wheelchair accessible room(s). DESCRIPTION: Located on Victoria's inner harbour, just steps away from major attractions. Accommodation: TV, telephone, coffee maker, microwave, mini fridge, iron with board, in-room safe, hair dryer, rollaway bed $10. Facilities: 7 floors with elevator, non smoking property, heated outdoor pool, fitness centre, sauna, whirlpool, steam room, parking $8. DESCRIPTION: Classic comfort in a convenient downtown location, close to shops & attractions, the Inner Harbour, and other popular destinations. Accommodation: air conditioning, TV, telephone, WIFI internet access (free), cable internet access in-room (charge), coffee maker, mini fridge, iron with board, in-room safe, hair dryer, rollaway bed $15, Green Key. Facilities: 18 floors with elevator, restaurant, bar, indoor pool, fitness centre, hot tub, parking $15, pet friendly property. Wheelchair accessible room(s). DESCRIPTION: Located on Blanshard Street just 2 kilometres from the Inner Harbour, this hotel is close to attractions such as Butchart Gardens and Royal BC Museum. Accommodation: air conditioning, TV, in-room movies (charge), telephone, WIFI internet access (free), coffee maker, iron with board, hair dryer. Facilities: restaurant, non smoking property, bar, room service, fitness centre, guest laundry, parking free. Wheelchair accessible room(s). DESCRIPTION: Located in downtown Victoria, just steps away from the Inner Harbour, boutique shops, whale watching, museums and many arts & cultural activities. Accommodation: TV, telephone, WIFI internet access (free), cable internet access (free), coffee maker, microwave, mini fridge, iron with board, in-room safe, hair dryer, rollaway bed not available. Facilities: restaurant, bar, coffee shop, fitness centre, hot tub, steam room, guest laundry, parking $20, pet friendly property. Wheelchair accessible room(s). DESCRIPTION: Perfectly located in downtown Victoria, our hotel is only a few steps from the Inner Harbour and the best shopping, dining, arts and entertainment Victoria has to offer. Accommodation: TV, in-room movies (charge), telephone, WIFI internet access (free), coffee maker, iron with board, hair dryer, rollaway bed $25, Green Key. Facilities: 12 floors with elevator, restaurant, non smoking property, bar, indoor pool, fitness centre, sauna, hot tub, business centre, children 5 and under eat free, parking free, pet friendly property. Wheelchair accessible room(s). DESCRIPTION: Located in a resort enclave on Victoria's lovely Inner Harbour known as Belleville Park. Accommodation: TV, telephone, internet access (charge), clock radio, coffee maker, iron with board, hair dryer, rollaway bed $20. Facilities: restaurant, non smoking property, bar, fitness centre, sauna, hot tub, parking free. Wheelchair accessible room(s). DESCRIPTION: Downtown Victoria hotel situated on Inner Harbour, within walking distance to the legislative building, the Victoria Conference Centre, and shopping and entertainment venues. Accommodation: air conditioning, TV, in-room movies (charge), telephone, WIFI internet access (free), rollaway bed free, Green Key. Facilities: restaurant, non smoking property, bar, room service, indoor pool, fitness centre, business centre, parking $15, pet friendly property. Wheelchair accessible room(s). DESCRIPTION: Located two blocks away from the famous Inner Harbour and some of Victoria's best known attractions. Accommodation: TV, telephone, coffee maker, mini fridge, iron with board, hair dryer, rollaway bed $15. Facilities: restaurant, bar, indoor pool, fitness centre, steam room, parking $10, pet friendly property. DESCRIPTION: Downtown elegant suite-hotel, directly across the Street from the BC Museum and a close walk to Victoria's Inner Harbour, close to shopping and dining. Accommodation: TV, telephone, coffee maker, balcony, hair dryer, rollaway bed $20. Facilities: restaurant, indoor pool, fitness centre, sauna, hot tub, guest laundry, parking $4. Wheelchair accessible room(s). DESCRIPTION: Comfortable property located a 5 minute drive to downtown Victoria. Accommodation: TV, telephone, clock radio, coffee maker, iron with board, hair dryer, rollaway bed $15. Facilities: restaurant, bar, heated outdoor pool, parking free, pet friendly property. DESCRIPTION: Boutique hotel located in downtown Victoria, one block from the Inner Harbour, the BC Museum, and shopping and dining. Accommodation: TV, telephone, internet access, clock radio, coffee maker, iron with board, bathrobe, hair dryer, rollaway bed free. Facilities: restaurant, non smoking property, bar, indoor pool, fitness centre, sauna, whirlpool, guest laundry, games room, gift shop, parking free. DESCRIPTION: Situated on Douglas Street just a 5-minute drive to the city centre, this hotel is close to shopping and entertainment. Accommodation: air conditioning, TV, telephone, internet access (charge), clock radio, coffee maker, hair dryer, rollaway bed $10, Green Key. Facilities: 4 floors with elevator, restaurant, bar, indoor pool, fitness centre, hot tub, guest laundry, parking free. Wheelchair accessible room(s). DESCRIPTION: Situated in Victoria's Inner Harbour, this hotel is adjacent to the Parliament Buildings, and within walking distance to shopping, dining, and local attractions. Accommodation: TV, telephone, WIFI internet access (free), cable internet access (free), coffee maker, rollaway bed $20. Facilities: restaurant, non smoking property, bar, outdoor pool, sauna, airport shuttle (charge), parking free. Wheelchair accessible room(s). DESCRIPTION: Located in the residential neighbourhood of James Bay, this unique hotel offers an eclectic mix of rugged West Coast and contemporary design. Accommodation: TV, telephone, internet access (charge), coffee maker, microwave, mini fridge, kitchen, iron with board, hair dryer, rollaway bed not available, Green Key. Facilities: restaurant, bar, fitness centre, parking $10. Simply contact us through our online form to obtain competitive quotes for hotels in Canada. We will get back to you as soon as possible.